Lately I have virtually toured so many homes for Christmas, and I am so excited to be posting our Christmas house tour now. 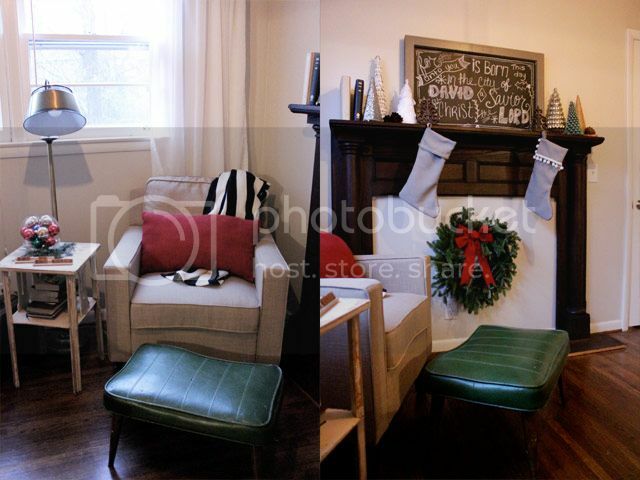 Last year was my first year decorating a house for Christmas (see the tour here), and it was such a fun experience. This year, I tried to change things up a little bit while still using most of the same decorations. I was able to get by with only buying a couple spools of ribbon, three live wreaths and a $2 artificial wreath, a garland, and four 25 cent cloth napkins at a thrift store. But before the photos, let me say something. 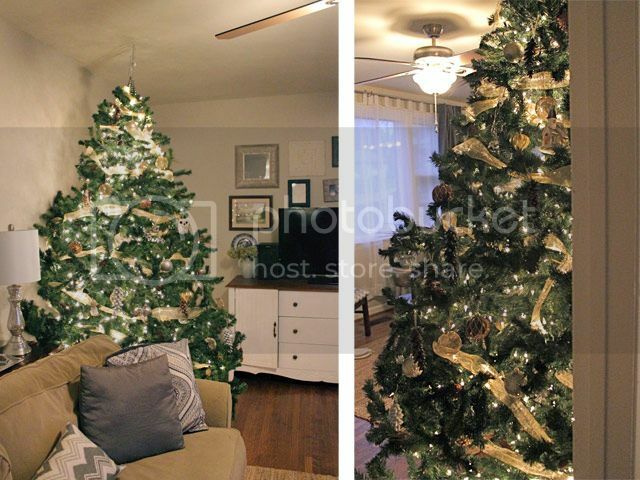 Christmas is the time of year when nearly everyone becomes a home decorator. 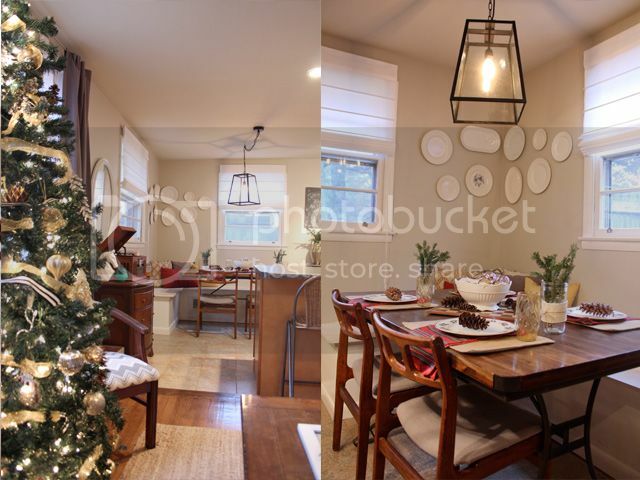 As we put up our lights and our trees and deck the halls with our own unique and sentimental items, homes are given new life that we treasure for those few short weeks at the end of every calendar year. But with that comes a huge temptation to compare ourselves to others. So, I want this house tour to be different. Please don't compare yourself to me as I so often do to other people. I look at other people's homes on blogs and Instagram and in magazines and movies, and I get self conscious. A million thoughts run through my mind. Maybe we should get a bigger tree. I wish I could take better pictures. Why don't my vignettes look like that? If only I had a bigger budget. I wish our house had more architectural details. I often scoff at the materialism of consumer Christmas as we have made it these days. 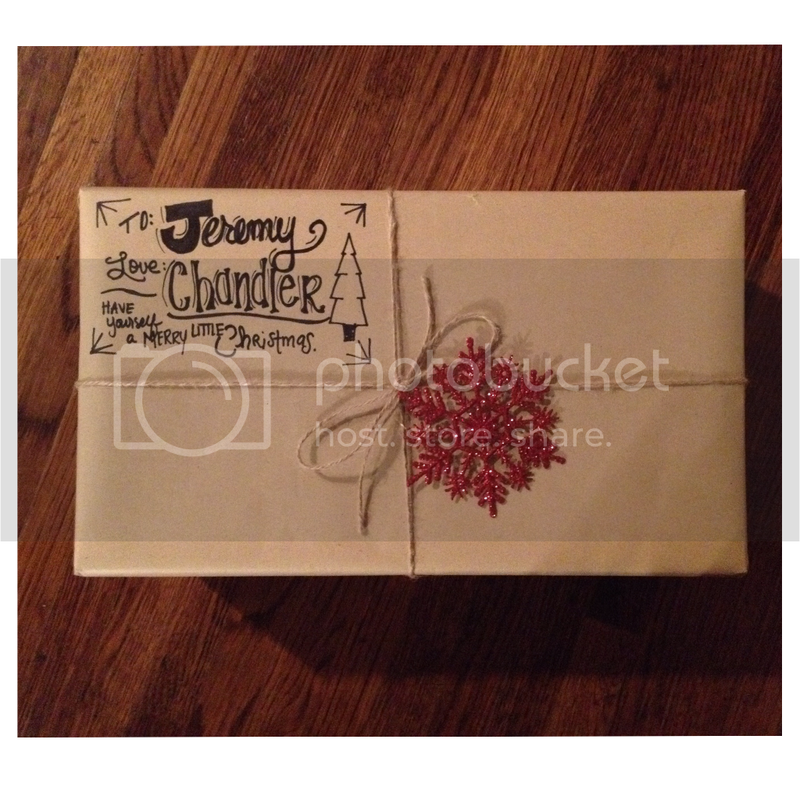 Jeremy and I don't spend inordinate amounts of money on gifts nor do we make that the focus, but yet I fall into the same trap of pride when I idolize a beautiful Christmas over a holy one. 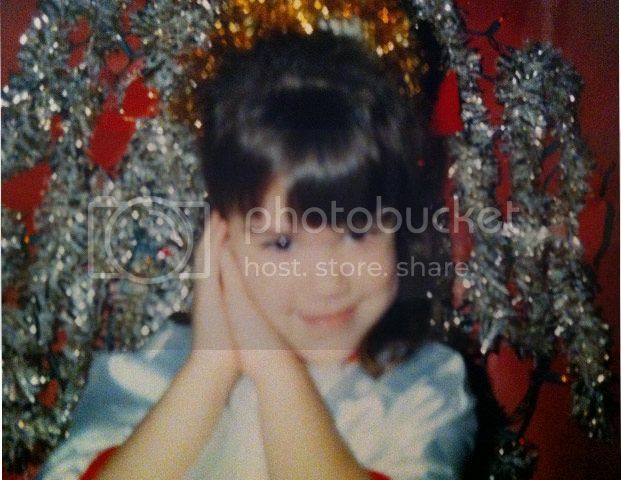 This year, I want Christmas to make me more holy. More like that Jesus who was born as a baby. I want to take the time to soak in His work and word. I also want to make family memories, and I want to find joy in the home God has blessed us with, but not at the expense of holiness. So my prayer is that you will be inspired by the little things we did in our home to make your home a place for family togetherness, warm memories, and personal sanctification this holiday season. Be inspired that it doesn't have to be expensive or perfect. 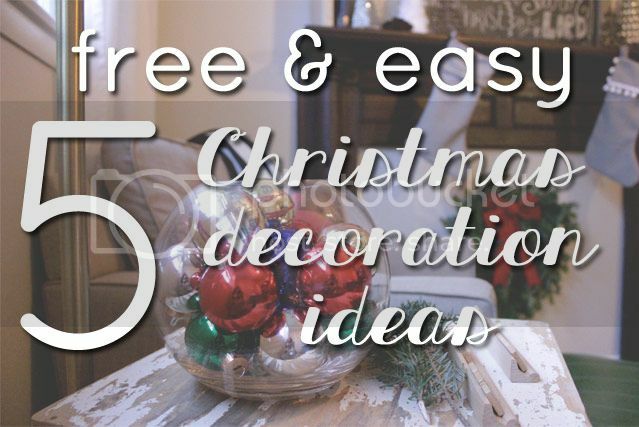 It doesn't have to touch every room in your house (I really only decorate three rooms). I'm preaching to myself on this one and reminding myself of the true meaning of the season. In that spirit, come on in. 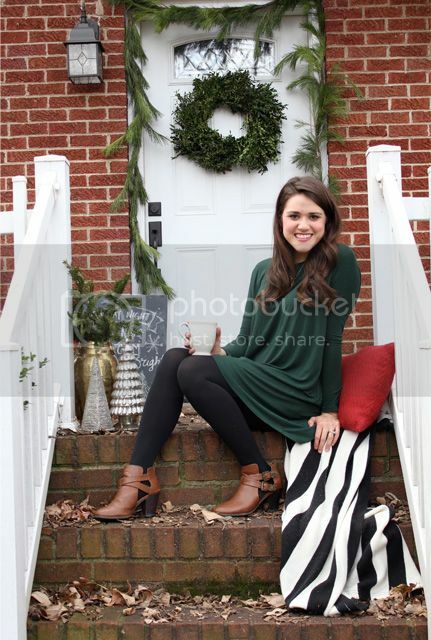 I decorated the front porch for our Christmas card photos. I will show some more of those later once the cards go out :-) All that stuff doesn't sit on the porch permanently, but it's fun to dress up for a special occasion. 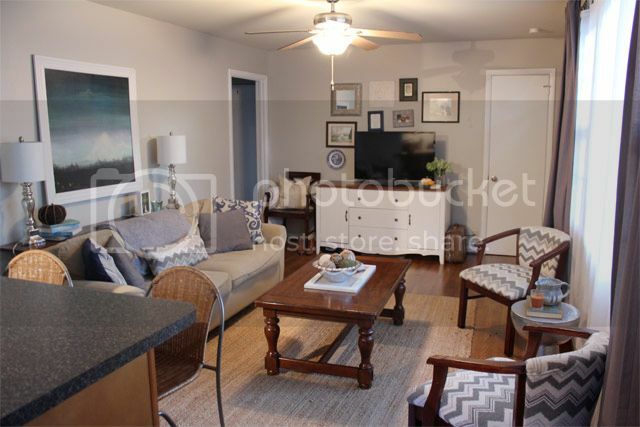 Here is the living room from the other angle. 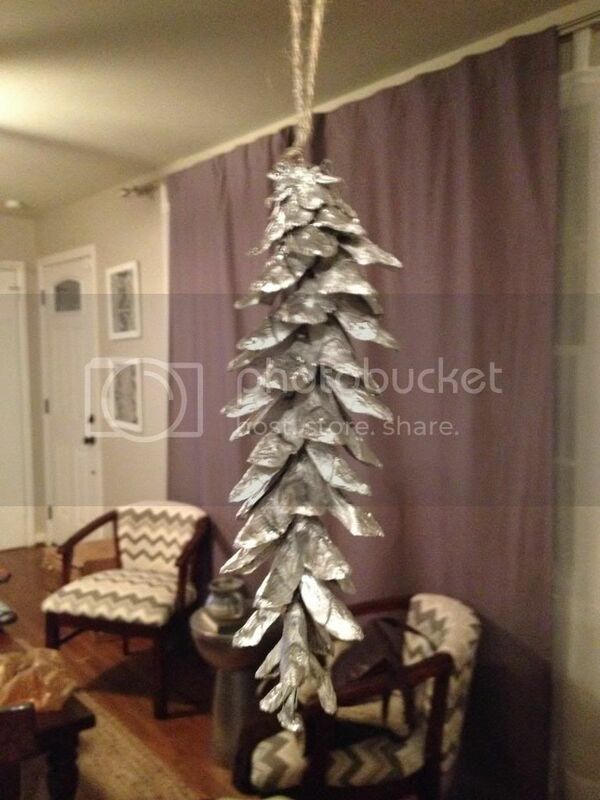 Last year, my tree was all metallics and neutrals. 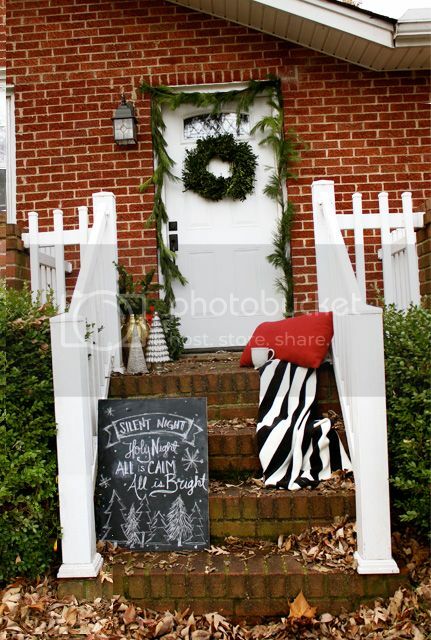 This year, I added a few pieces of black and white stripe ribbon for some contrast and I love it! 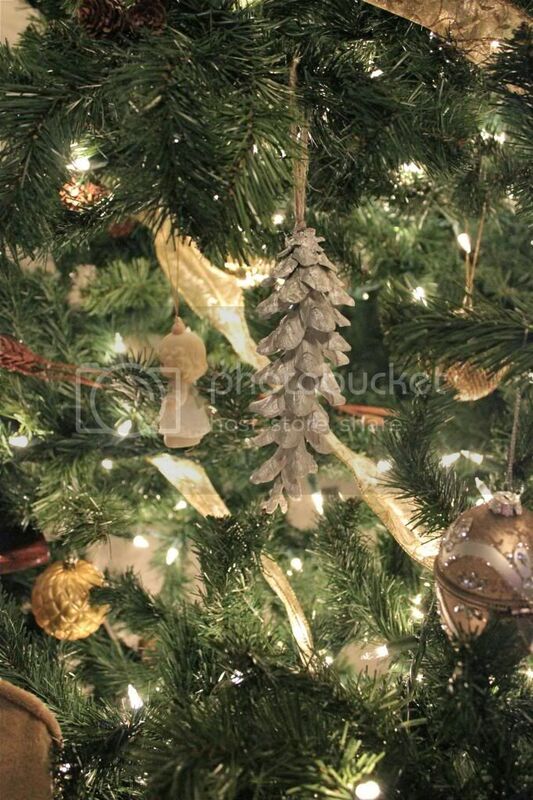 Next year, I want to wrap the whole tree in black and white ribbon, but I ran out of ribbon and didn't want to spend any more money :-) I reused some Free DIY Pinecone Ornaments from last year. Let's head into the dining area! 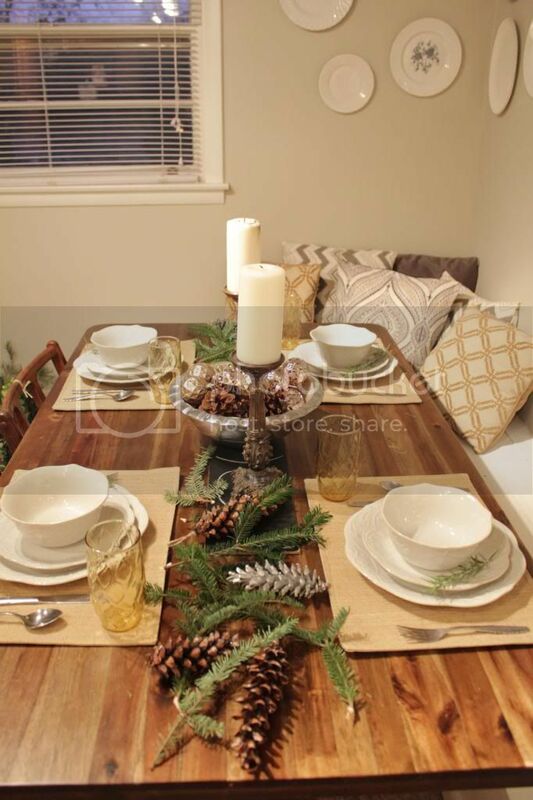 Tip of the day: setting your table automatically makes your home feel more decorated. I changed out some pillows this year on the banquette and added pops of red. 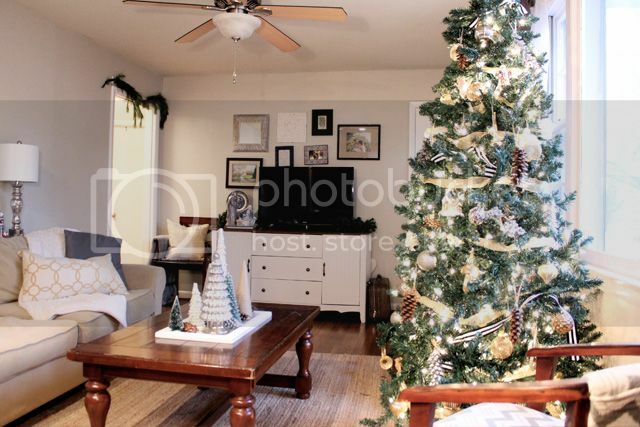 Last year, the whole house was pretty neutral, but I had fun adding in classic red. I got all four of those plaid napkins for $1 total at a thrift store. We were given the Christmas plates. I threw some leftover ornaments in a bowl, free tree clippings in mason jars, scattered pinecones around, and called it done! This time of year, I love spinning Christmas records. We found several at a record shop a couple of weeks ago, and we have been enjoying them so much! A few more kitchen details... Finally, our little reading and music room. 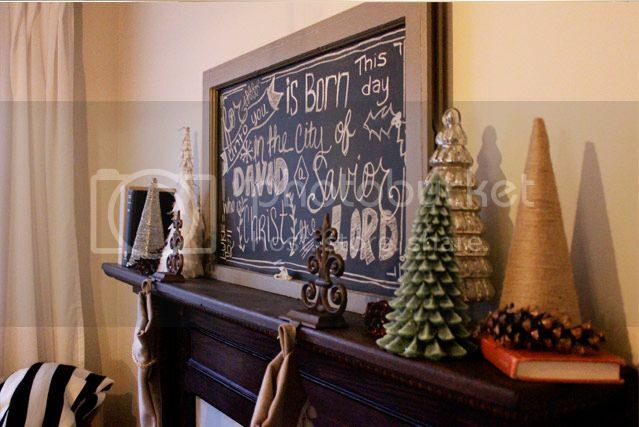 I love dressing up this mantel. Even though we don't do a real tree, having real fraser fir wreaths (which are always $5 on Black Friday at Home Depot), brings in the scent of fresh greenery. 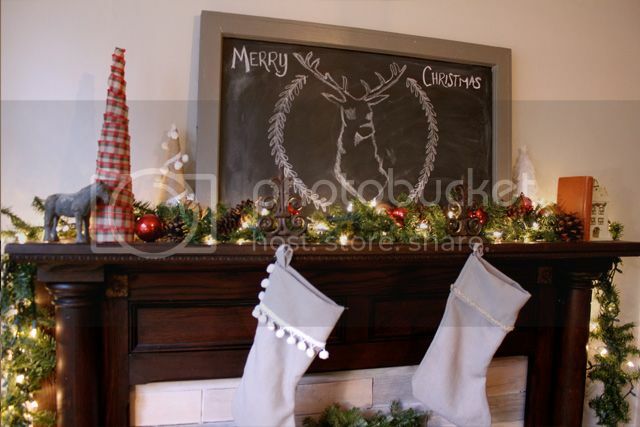 I drew that handsome buck on the chalkboard, and he wishes you a very Merry Christmas. 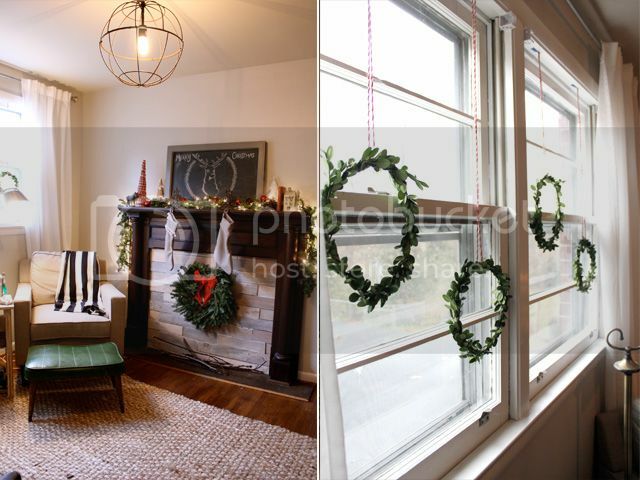 Finally, I hung some sweet little DIY boxwood wreaths with that candy cane twine over the window. Thank you for coming over, friends. Go love your home. And seek Jesus this season. 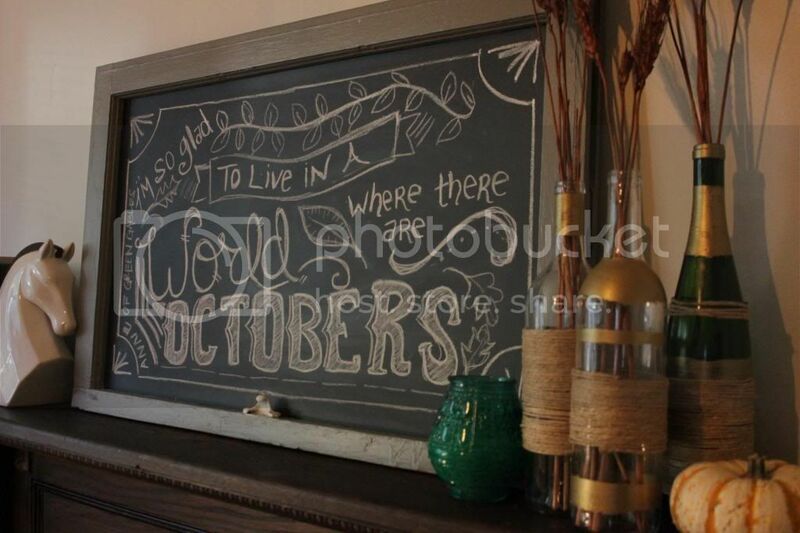 Decorating for fall and, soon after, for Christmas are two of my favorite things. 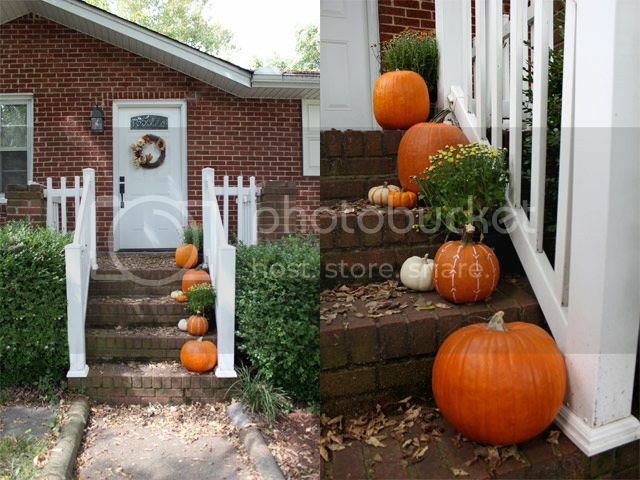 The level of cheer in our home goes up a couple notches with seasonal decorations for my two favorite times of the year. 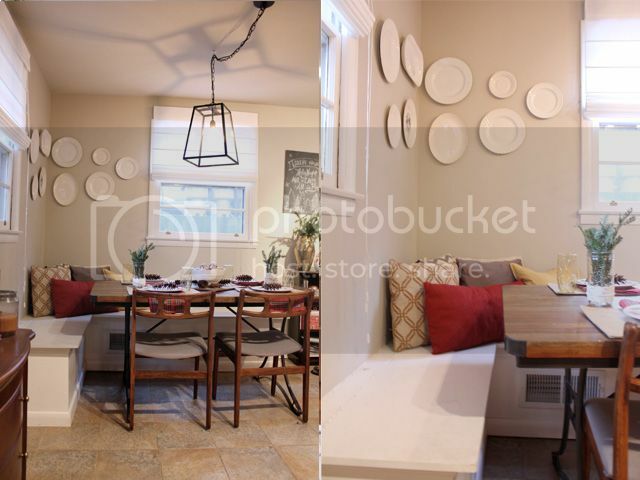 We are in the midst of some rather major home projects currently, and it is nice to do some simple decorating instead of a big renovation. 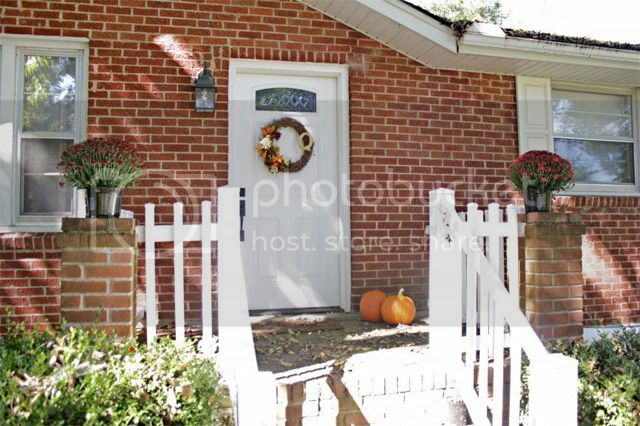 It's the small touches like branches from the yard, fresh cut hydrangea, and pumpkins everywhere that bring Autumn home and get me excited for this season of change, beauty, cozy nights, sunny days, fresh apples, pumpkin spice, and traditions. I will let the pictures do the talking. Come on in. 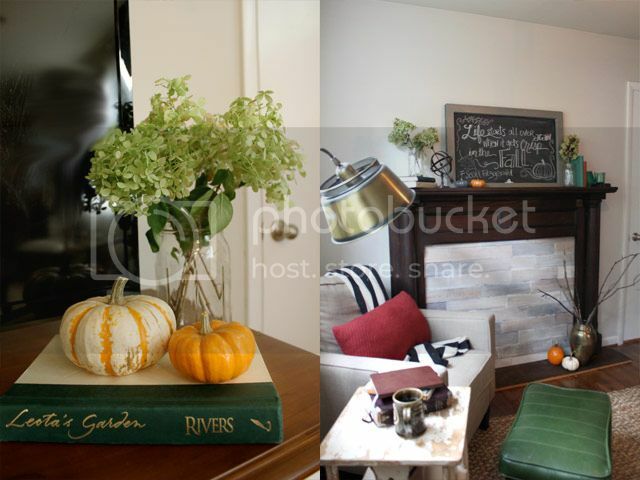 Decorating for fall doesn't have to be elaborate or expensive. 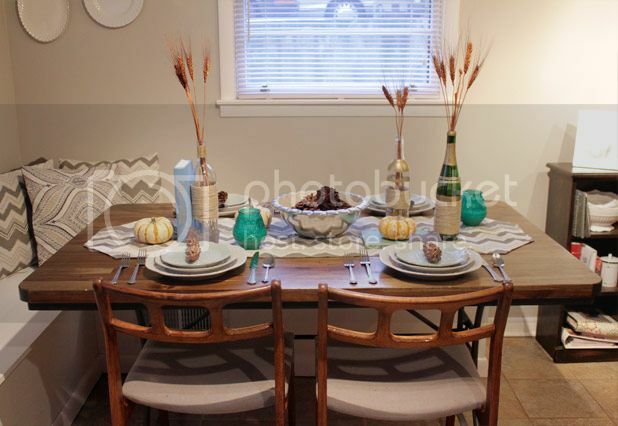 The only things I bought were two small mums, some fresh pumpkins, and that new table runner to create my tablescape. 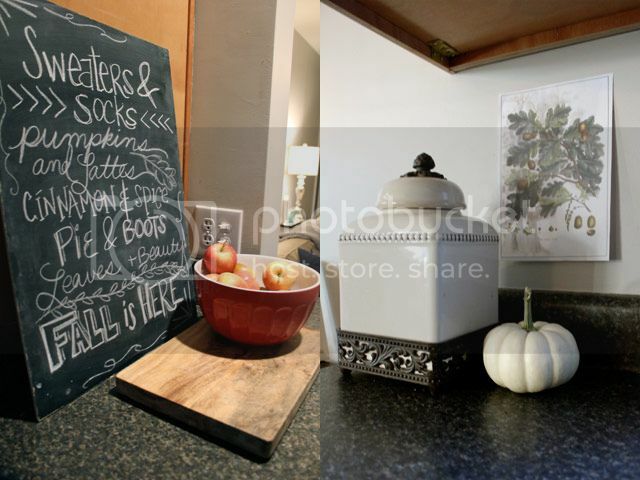 Then I painted some of the small pumpkins with paint pens, gathered hydrangeas and sticks from the yard, got out some blankets, displayed our apples in a red bowl, and made use of our existing chalkboards. 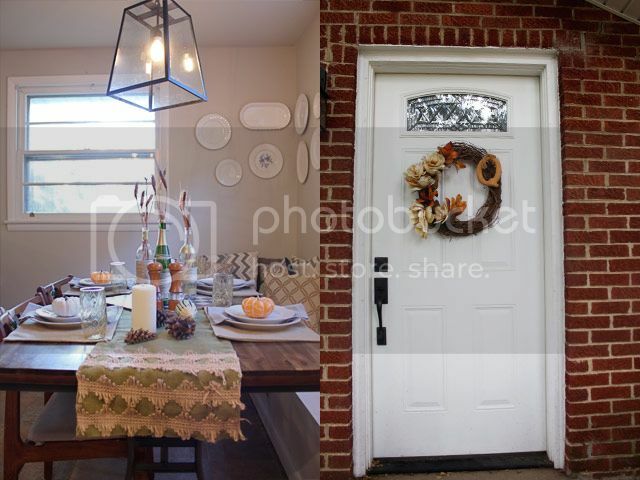 Whenever I decorate seasonally, I love to take a look at the things we already have (whether on display, in storage, or even in the yard) and just give them a fresh, seasonal spin. Ah, Christmas. The most wonderful hectic time of the year. Time and budget seem to run in shorter supply. That's why I really tried this year to go easy on my pocketbook and my pocket watch with FREE & EASY Christmas decorations. 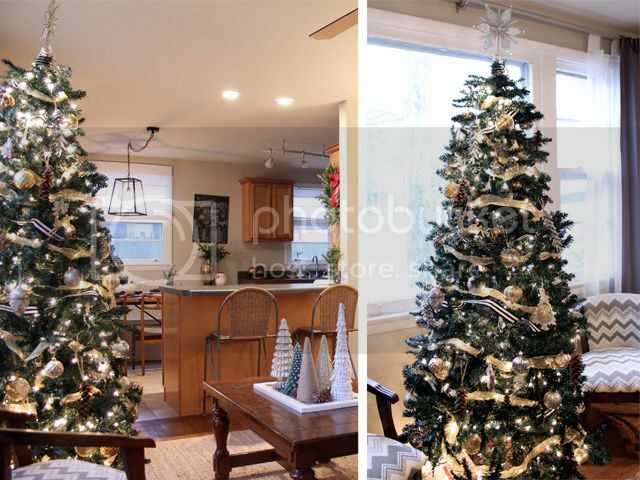 It was my first year decorating a full house for Christmas, and I was able to get away with only buying 2 mini silver Christmas trees, $6 worth of ornaments, a few strands of lights, two fraser fir wreaths, and a few simple craft supplies. So, I'm here to talk to you about using what you have and what you can get for free to make your house Christmas ready. 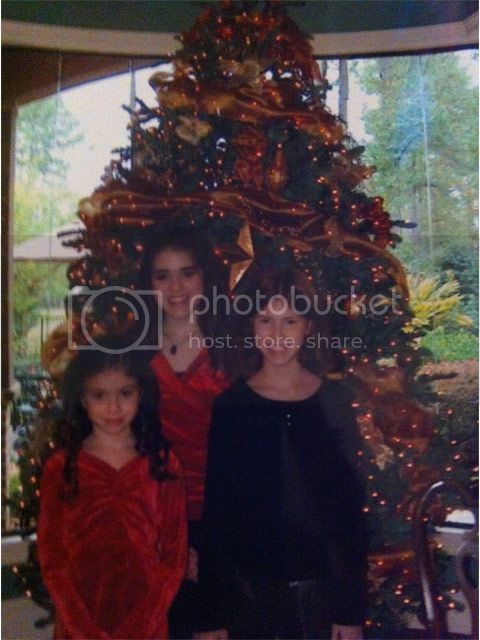 For more Christmas house pictures, see the tour. 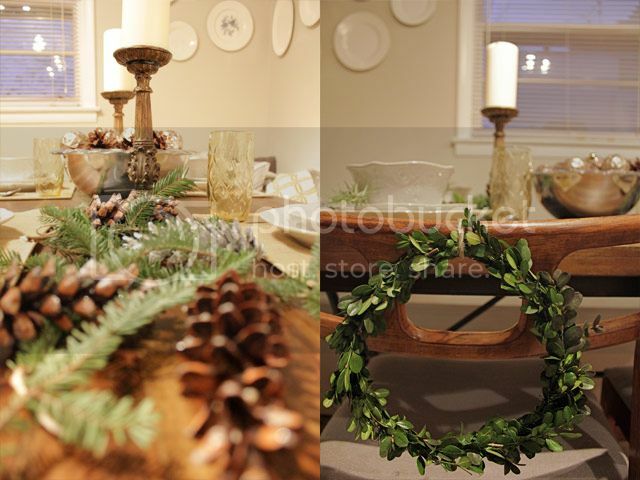 Mini boxwood wreaths and rosemary on the table settings. Holly & Rosemary as accents. Fresh greenery really adds a touch of natural cheer, and your bushes will thank you for lightening their load. 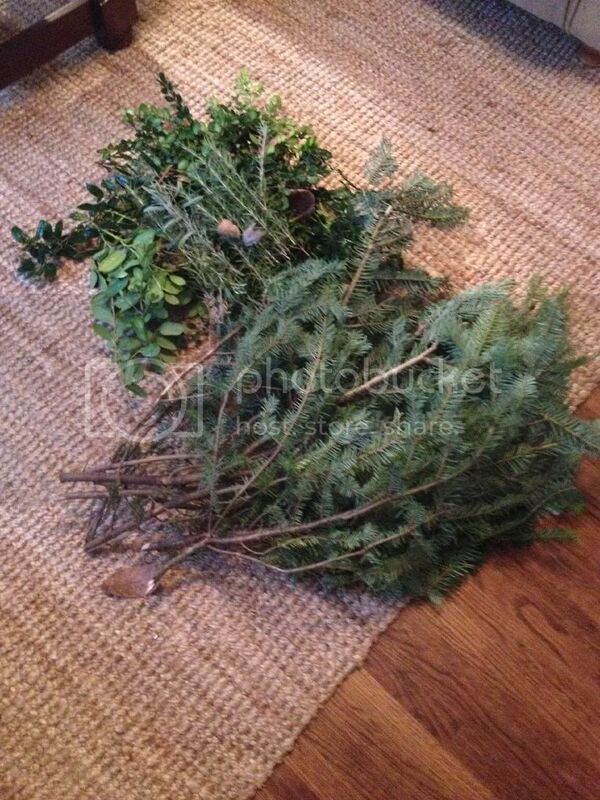 Someone recommended to me this year that I visit a Christmas tree lot and ask for their leftover tree clippings. I went to the Home Depot tree lot, and they had a bin FULL of leftovers from the bottoms of Christmas trees. 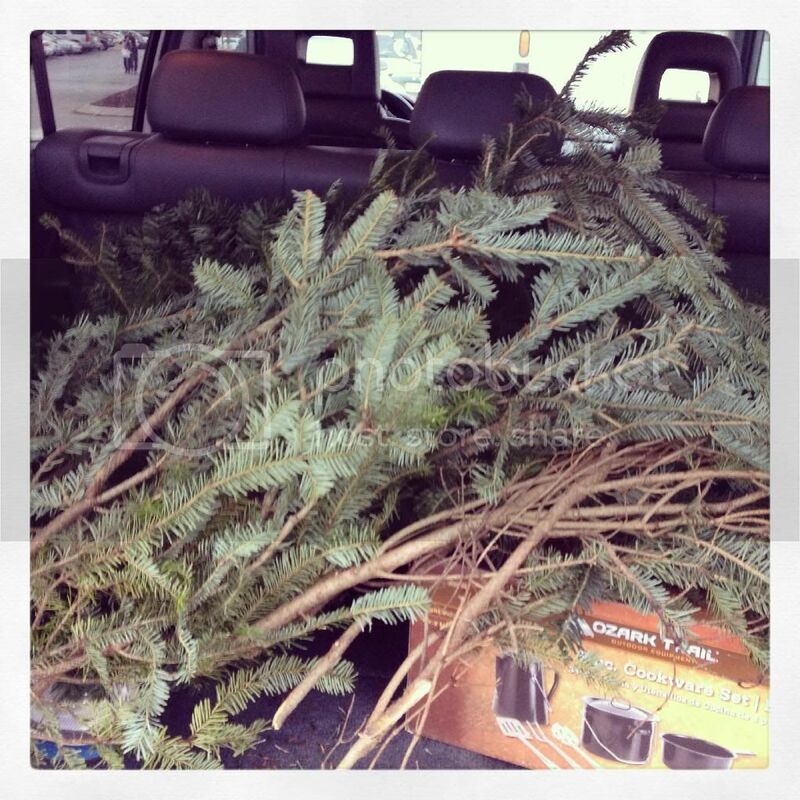 I came away with a trunk full, and that fraser fir is all over my house! 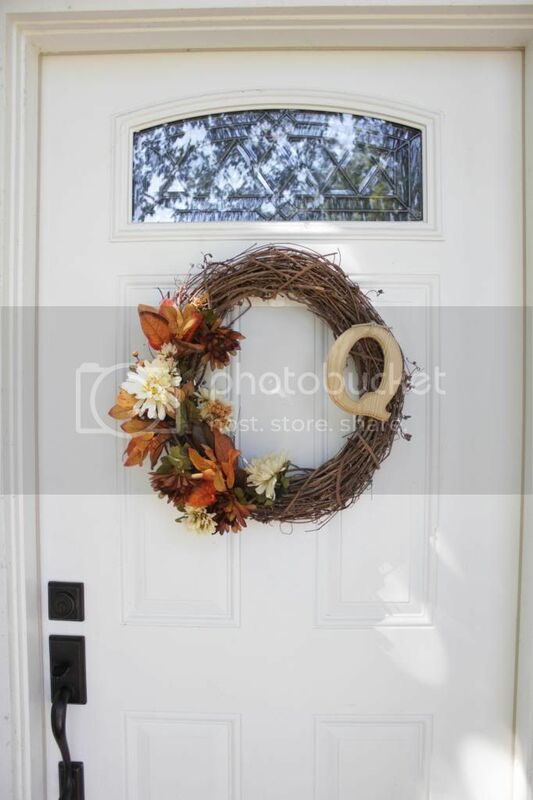 I made a wreath. 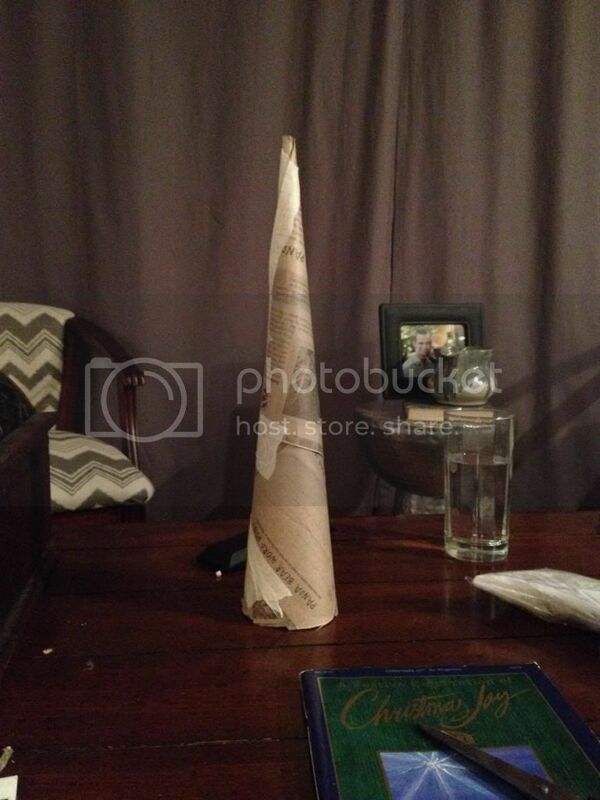 I added it to my table centerpiece. I filled vases. I made arrangements for above the kitchen windows. If it needed green, it got it. It automatically made everything look more decorated, and I didn't spend a penny. Sometimes things laying around your house that aren't even necessarily Christmas items can be festive when put in the right context. It doesn't have to be frosted or have Santa's face on it to say "Merry Christmas." I pulled some scrabble letters out of the dusty game in the basement. 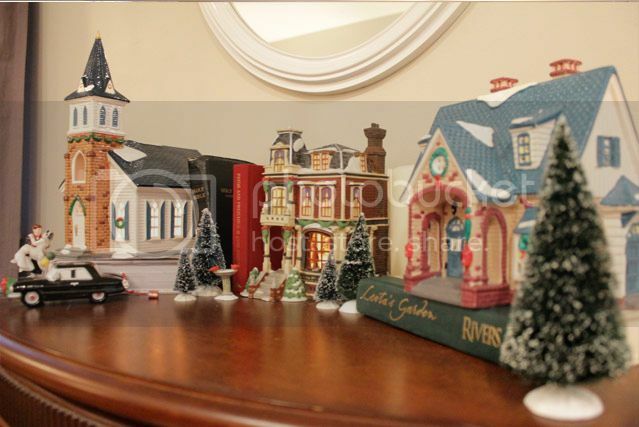 I used books in Christmas colors to add height to my Christmas village houses. 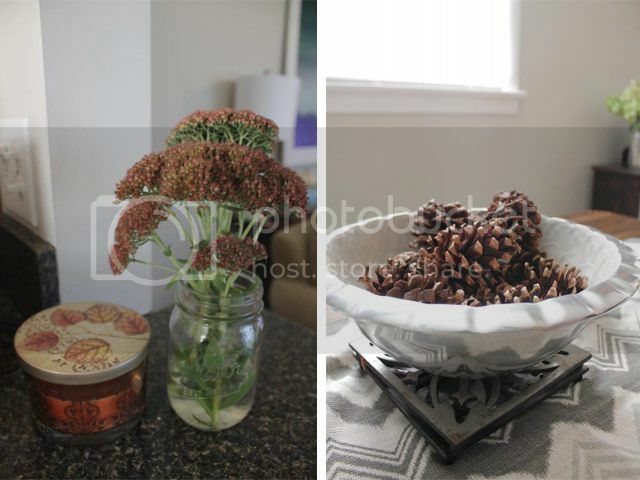 I pulled out some old candlesticks and replaced the candle with a pinecone. 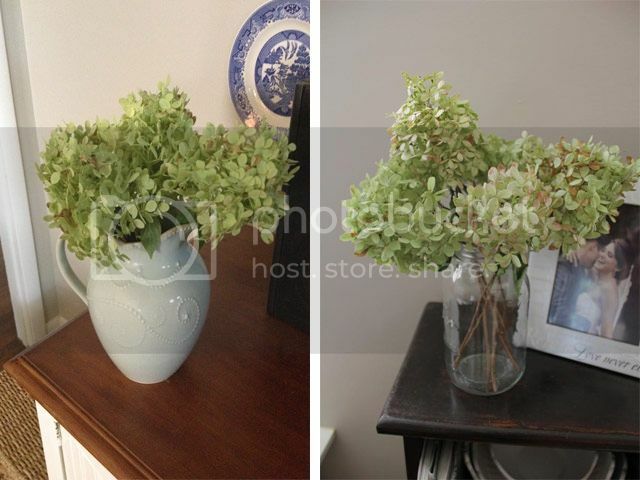 I put greenery in a gold vase that usually holds warm weather blooms. If you're like me, you have a few extra ball ornaments laying in the bottom of your storage bin that don't make it onto the tree every year. 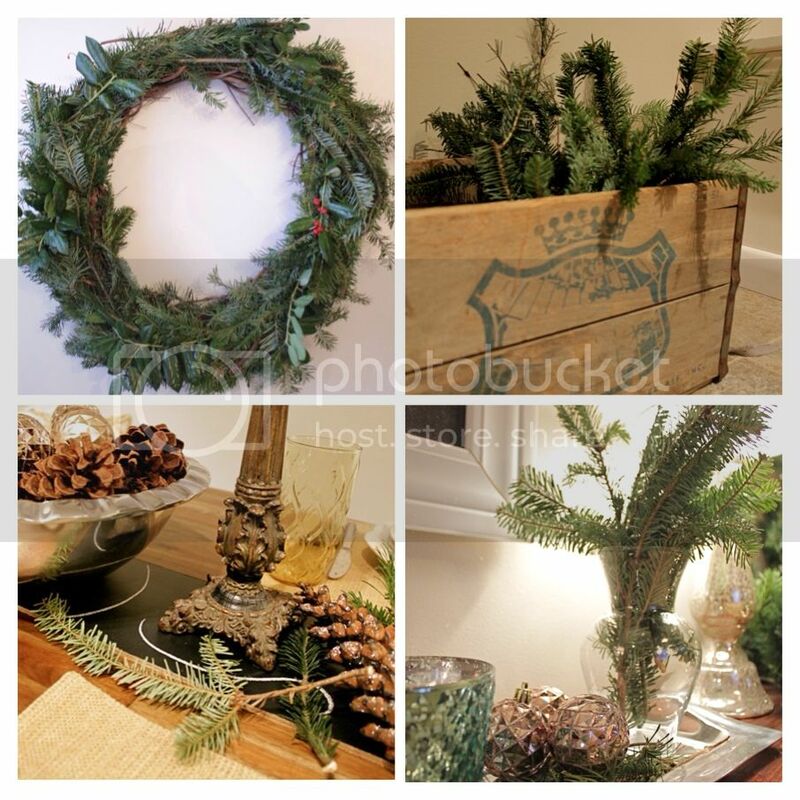 Use them in centerpieces, on table displays, or nestled in garland. 5. Wrap with what you have This year, rather than buying holiday specific wrapping paper, I decided to use simple craft paper and twine I already had (twine is my solution for everything), and do some creative things with the wrapping. I treated it like a chalkboard. 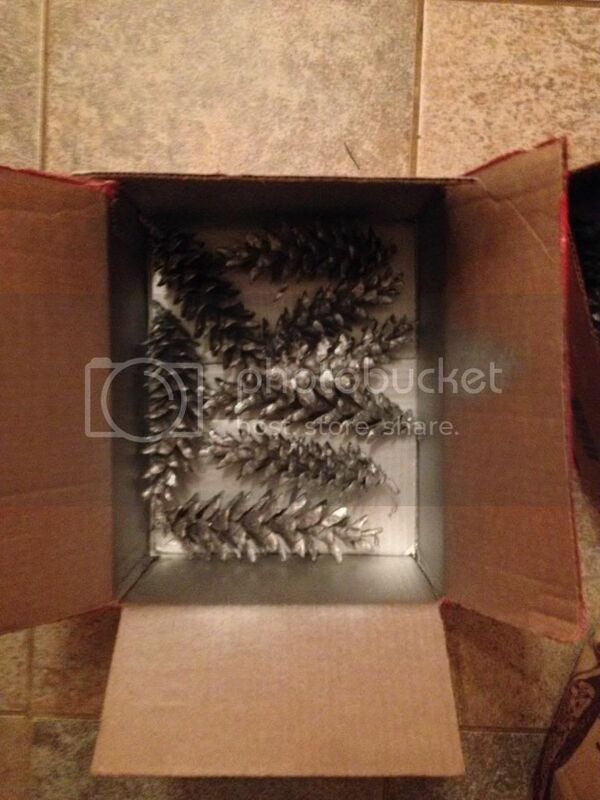 I added super cheap red snowflake ornaments ($2.50 for a 40 pack from Walmart) to the packaging. 6. 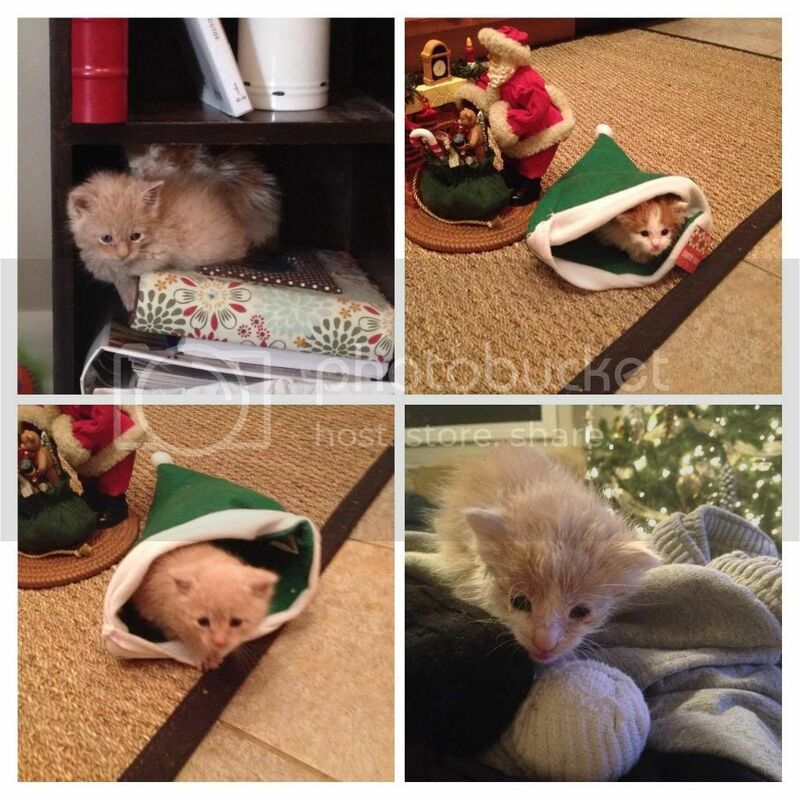 (BONUS TIP) Kittens If a neighborhood cat has kittens in your front yard and then abandons them the week before Thanksgiving, you can raise the kittens during the holiday until they are old enough to be adopted and take pictures of them in all of your Christmas decor. 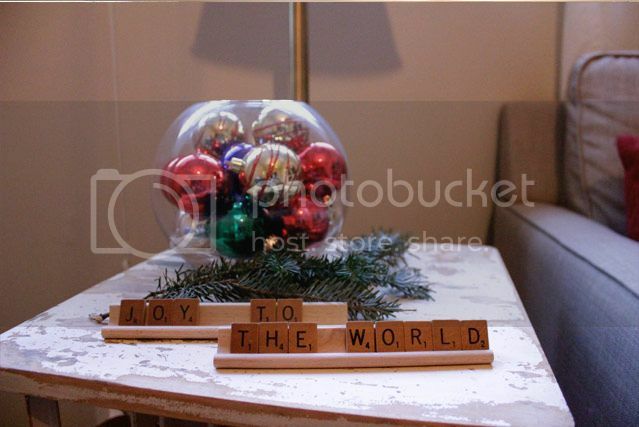 They are a (not) free and (not) easy but completely adorable addition to any holiday home. It's amazing how quickly the present becomes the past. How easily the current moments become the moments we wish we could relive again, and how little we notice as they pass in front of us. This year, I'm reminded of the importance of cherishing these soon-to-be-past moments and letting the simple things be enough. It sounds cheesy. Maybe it is. But it's true. As winter spreads out its icy arms once again and hugs the world with wreaths and mangers and holly, the familiar sights, sounds and smells of the season churn up otherwise forgotten memories of Christmases past. Suddenly I am seven years old again, and the air mattress in my grandparents' den is like a bed fit for a princess when I fall sleep with the anticipation of Christmas coming the next day. The clock tick lulls my sisters, cousins, and me to sleep, and the chime of every hour brings us closer to the excitement of the morning. We wake each other up earlier than the adults would prefer only to find that a ribbon across the doorway is deterring us from going to see Santa's bounty too soon. Then I'm twelve, and colored pencils are the perfect instrument to write out my long awaited yearly Christmas play for the grandchildren to perform. 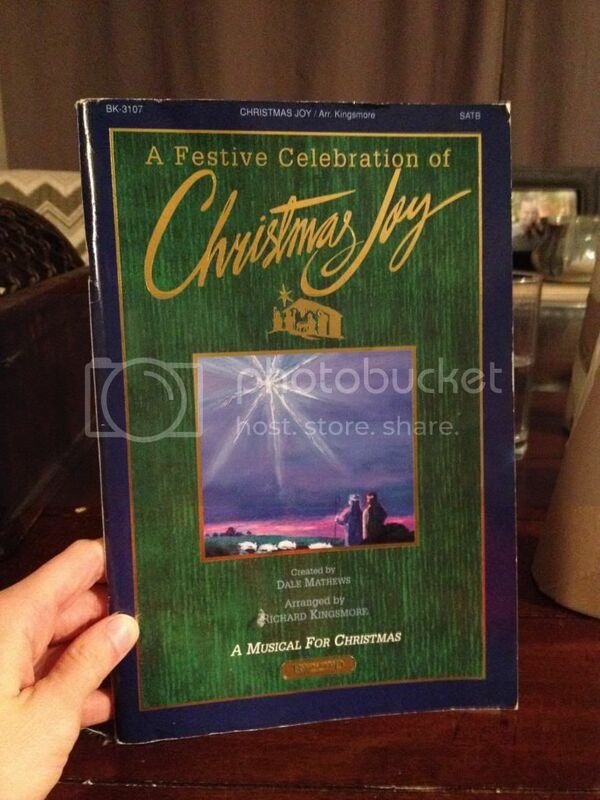 I have been planning the script and writing the songs since October, and if I can only get everyone to do it my way, this will be the best Christmas play in the history of Christmas plays. With only a few fits and fights, we pull off yet another modern take on the Christmas story as written by the illustrious playwright, yours truly, and the adults even seem to enjoy it. Soon I am fifteen, and my family is making a long road trip to visit my grandparents' home in small town, Kentucky. We arrive, and the snow capped roof tops around the town square make all the Roberts girls squeal with delight at the picturesque scene. When we reach the parsonage where Grandy and G-Daddy live, the warmth of the fire and the smells of Grandy's baked goods lure us inside where we find ourselves engulfed in the hugs of people we love and miss so dearly the rest of the year. My dad challenges me and my cousins to our traditional game of Monopoly, and we spend the days soaking up every minute of family time. 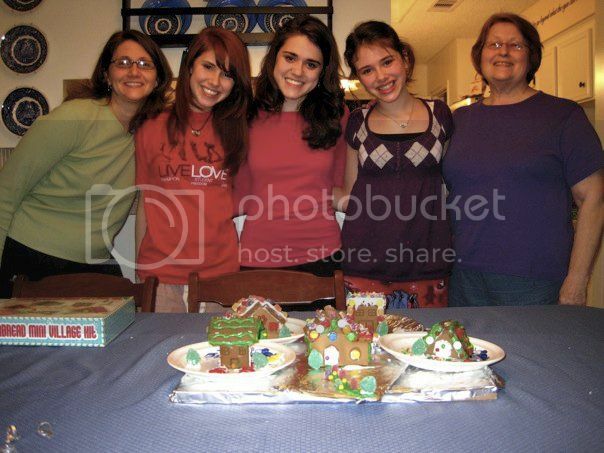 It is even somehow sweet to remember when I was sixteen, and I had jaw surgery just days before Christmas. My face was the size and shape of a basketball, and I could only eat liquid food. My mom put dressing and gravy in a blender, and it tasted like a feast. I felt happy for a moment until someone tried to take my picture and I yelled at them the best I could with an almost immovable mandible. Yes, even that Christmas brings a smile to my face now. One more blink and I am 19. 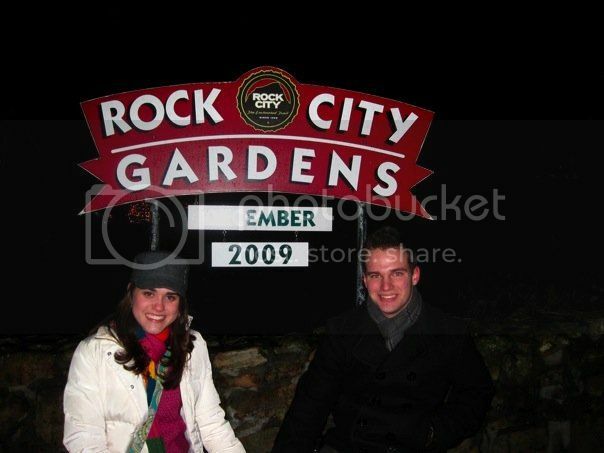 It's my sophomore year of college, and my (then) boyfriend Jeremy takes me on a day trip to Chattanooga to see a light display. We are eating Italian food by a roaring fire and a Christmas tree, and I can't stop thinking that this is the best date ever and hoping I get to spend my life with this guy, although he doesn't even know yet that I love him. 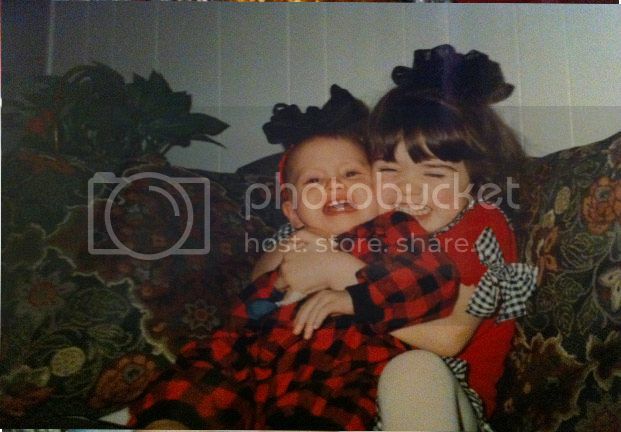 And now here I am--writing this blog and nearly crying with the fullness of all of these memories. The strangest thing is that I didn't even know they would be such important memories when they were only moments. This Christmas season I will be living through lots of moments. Some will be magical even as they pass through my fingers, and others will need time to season them into something sweet. I pray I will savor the moments while still allowing them to pass freely. I can't hold on too tight, and I know that the Lord has a season for everything. I spend a lot of time planning for how I will celebrate this season. 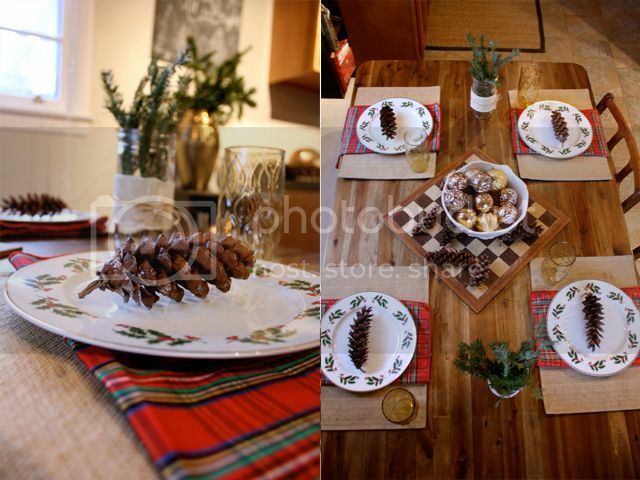 I peruse pinterest for hours looking for the perfect Christmas tablescape. I plan a "to do" list of things that I hope will somehow make Christmas more complete. But Christmas is simple. It's a king being born in a manger, for crying out loud. There were smelly animals who didn't use litter boxes, and they didn't even have Christmas cookies or anything. It's shepherds listening to the voices of angels to go see this baby in a barn. It's God's humble descent to earth. I love the holiday parties and the presents and the shopping and the Rockefeller tree and the hooplah, but the sweetest parts of Christmas are the simple things. I think simply capturing those moments as they pass and remembering the event those 2000 years ago that gave us a reason for those memories, is the only thing on the bucket list that really matters. May your Christmas be simple and the sweetest yet. Come on in. Are you new here? Let me show you around and pour you a cup of hot cocoa or coffee. This is my first year to really get to decorate a house for Christmas. Over the years, I have helped bring Christmas cheer to dorm rooms and apartments, but this year, I had a fresh new pallet to paint on, and it has been so much fun. I am going to be back with posts over the next few weeks with details on some of the projects I have done, so I will let the pictures do the talking today. 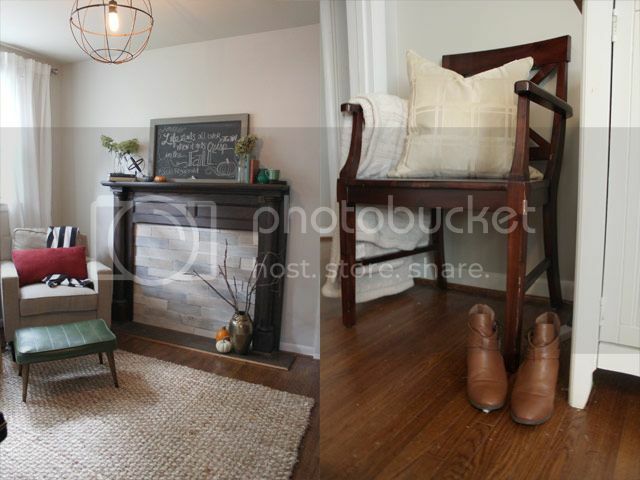 Most of the decor is stuff I found around the house, bought at thrift shops, and got for free. It is proof that CHEAP and EASY can be beautiful. I've stuck with the "natural neutrals" theme for the most part this year. 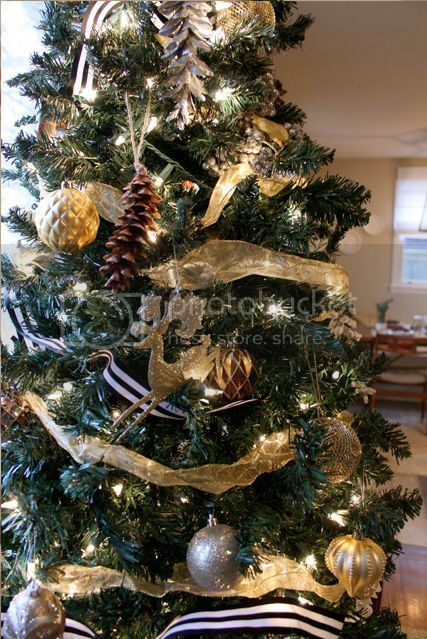 Lots of greenery, gold, silver, browns, and pinecones. 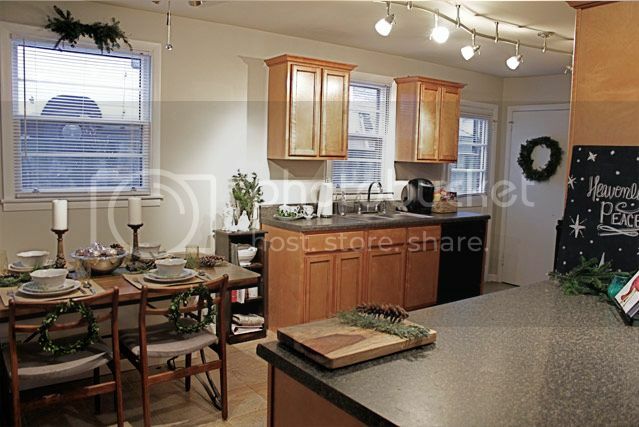 I have also confined most of the decor to the main living spaces. 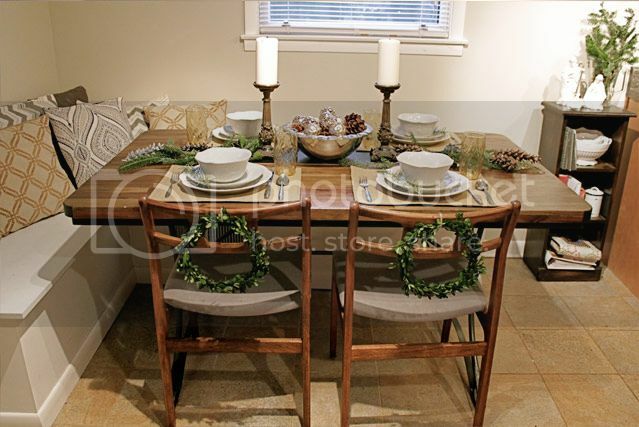 There are hints of Christmas in other rooms, but they are hardly worth noting. 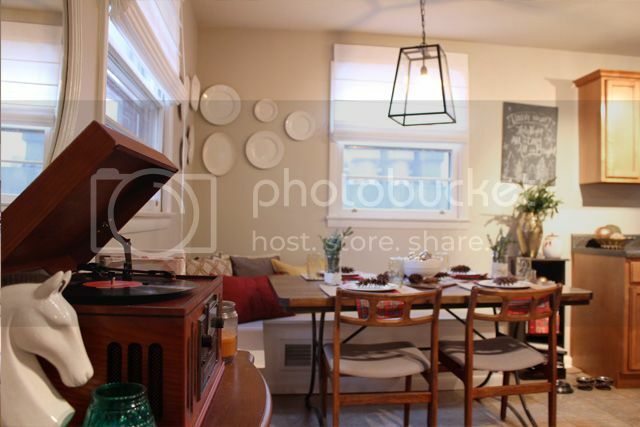 If you haven't seen the rest of the house before, be sure to check out the house tour page. Taking pictures was a struggle for this because it has been so overcast for days, and it gets dark so early! I did my best. 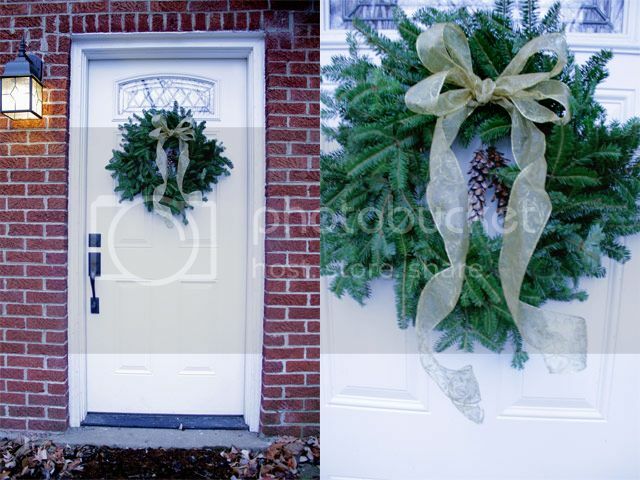 The front door is simply decorated with a live fraser fir wreath that I embellished with some ribbon and glittery pinecones. Welcome to the living room. 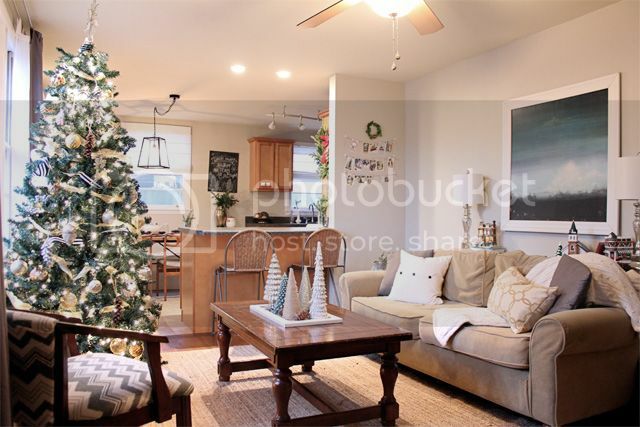 Our Christmas tree makes a big statement, and I have also added some holiday cheer with garland on the TV stand and some Christmas vignettes sprinkled here and there. Now let's step into the kitchen. The table is set for four. 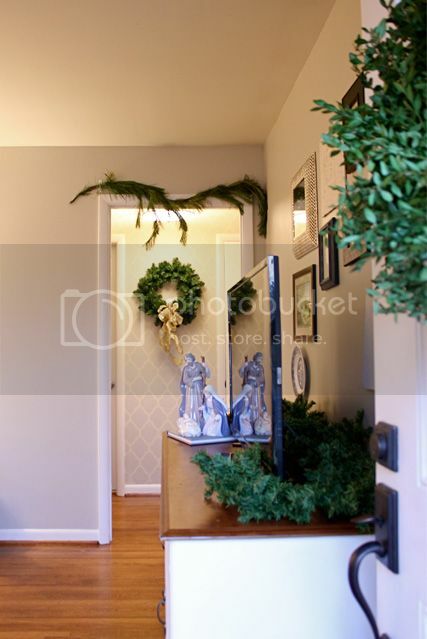 I love the boxwood wreaths I made from clippings from the yard (more on that later). 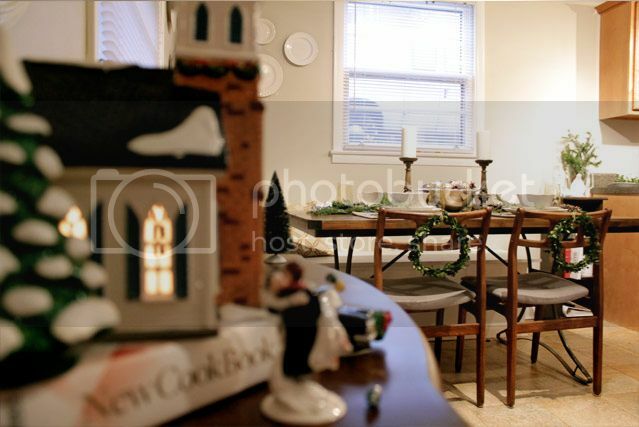 The candlesticks in the middle of the table are from our unity candles at our wedding. 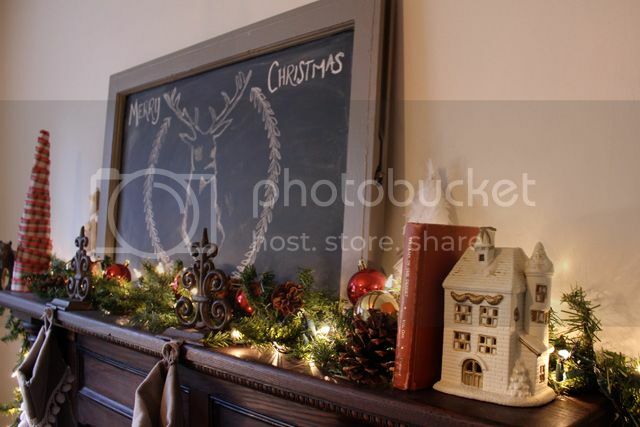 I used some leftover chalkboard under the centerpiece and sprinkled around some pinecones and fraser fir branches. For the rest of the kitchen, I simply added a few touches of Christmas here and there. 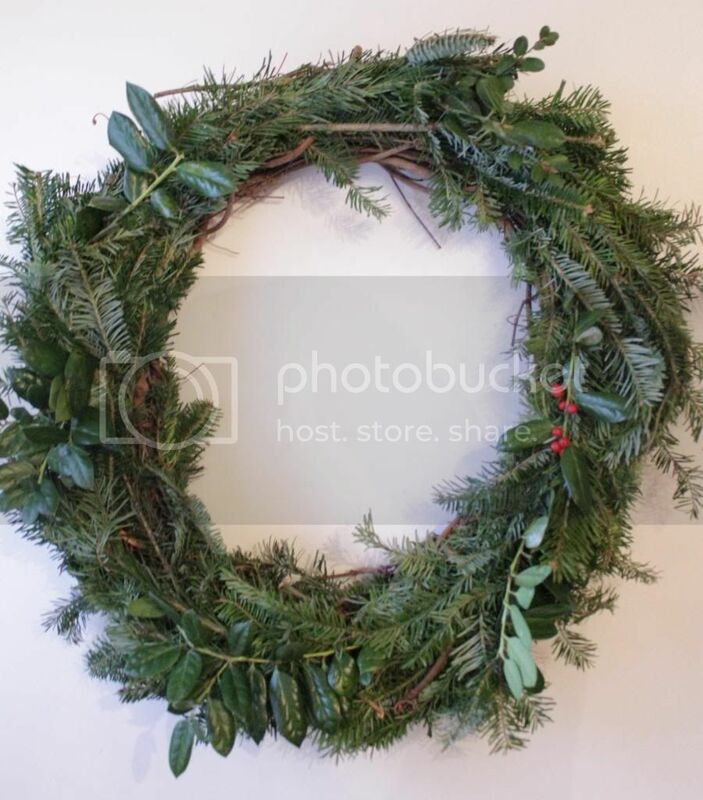 A wreath I made from Christmas tree clippings on the basement door. 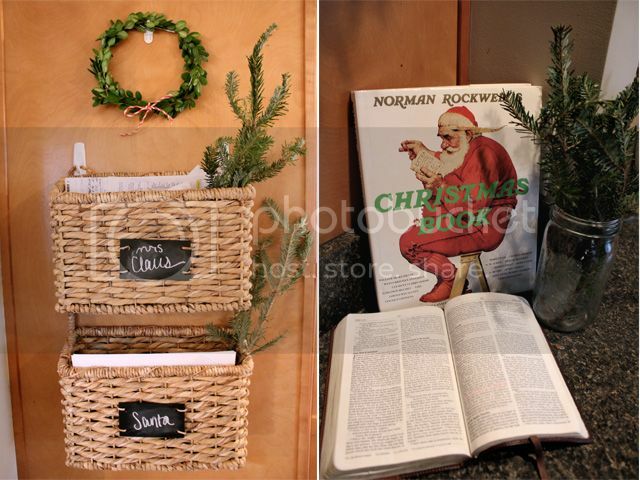 A chalkboard vignette with Norman Rockwell's Christmas Book that I found for 2 bucks at a thrift store. 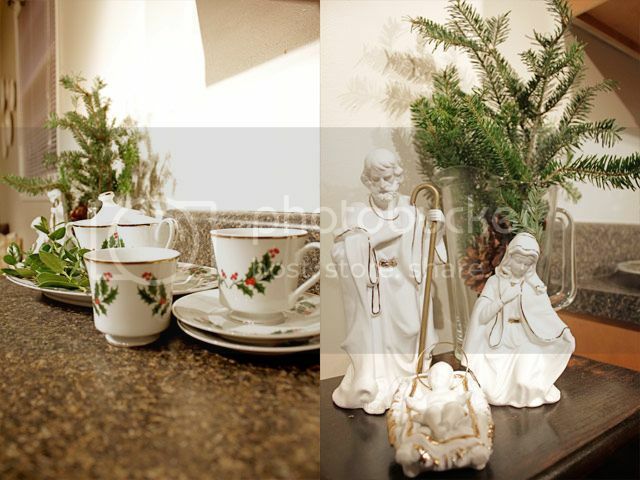 A little tea setting for some Christmas tea and a nativity to remember the real reason for the season. Christmas village as gifted by my mom and Grandma. 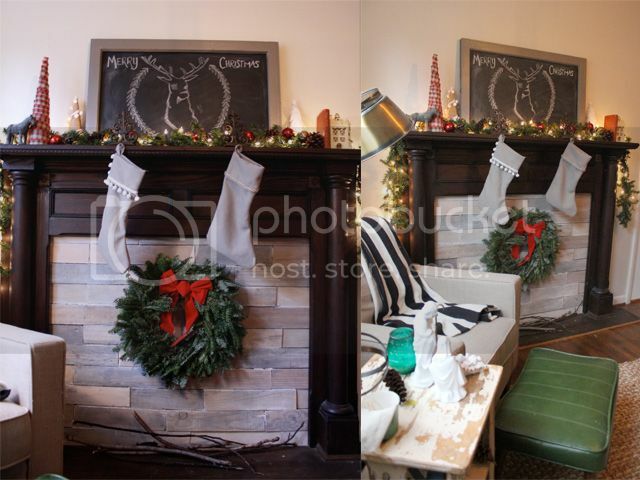 In the office, the stockings are hung by the chimney mantel with care. 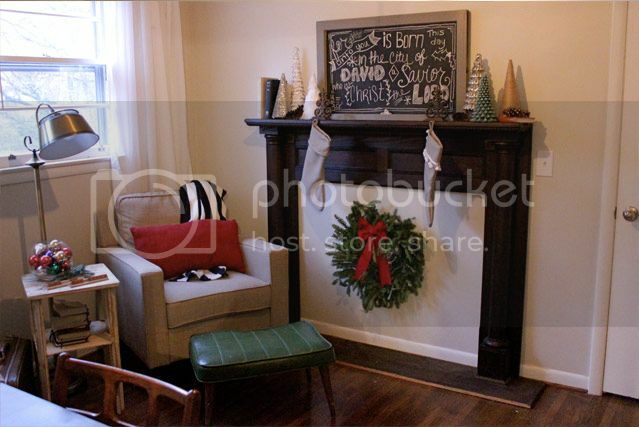 I made the mantel feel a little more complete (more permanent project on the way) with another real fraser fir wreath. A few more detail shots. Thanks for taking our Christmas house tour. Come back soon! 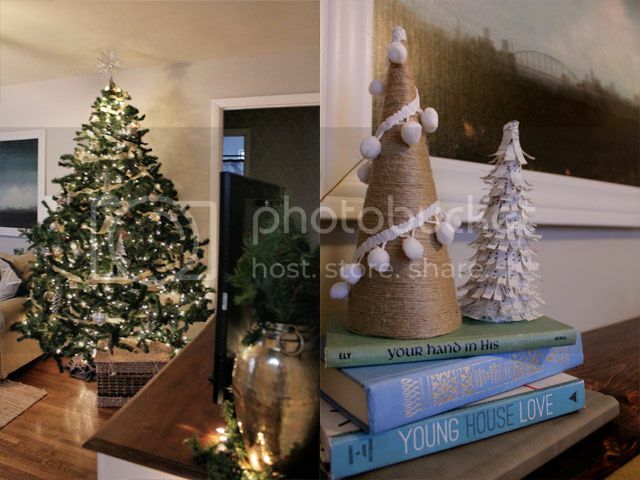 Monday I will reveal our whole Christmas home tour, but for today it's all about the tree. 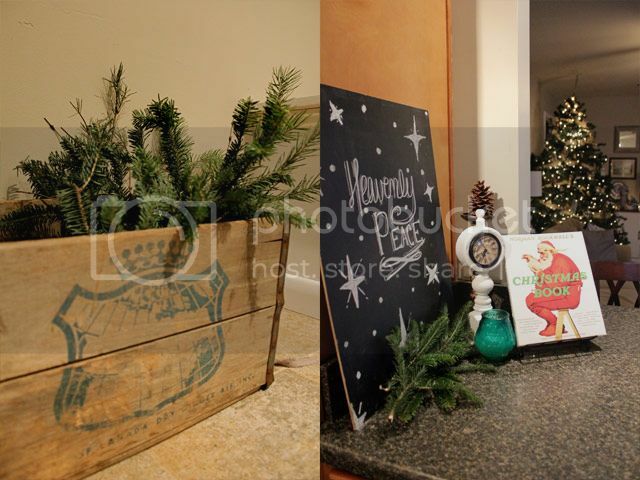 Last year, in our little apartment, we just used a baby tree and I put very little thought into the end result. It served its purpose. 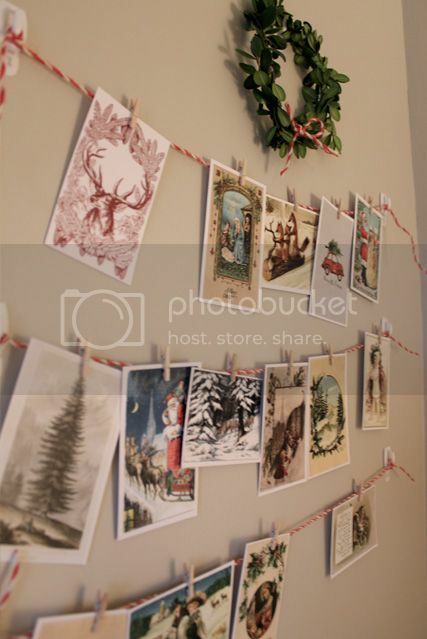 This year I decorated with a little more intentionality. 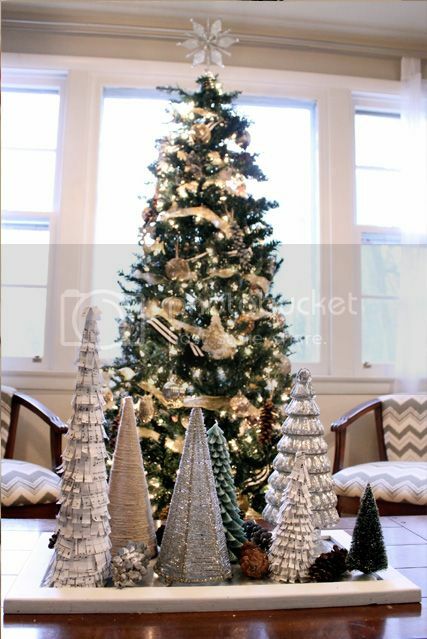 Here is our neutral & metallic woodland tree! I kept things in the brown/silver/gold family, and I love the way it turned out! This is the first time I've decorated a full sized Christmas tree, so I was a little worried about the cost of getting enough to fill it. Outside of lights (1000 lights, to be exact. Oy), I spent less than $10 on tree decorations this year. I'm sorry; what? I got a huge pack of 40 beautiful ornaments in just the right colors for $4.98 at Home Depot on Black Friday. 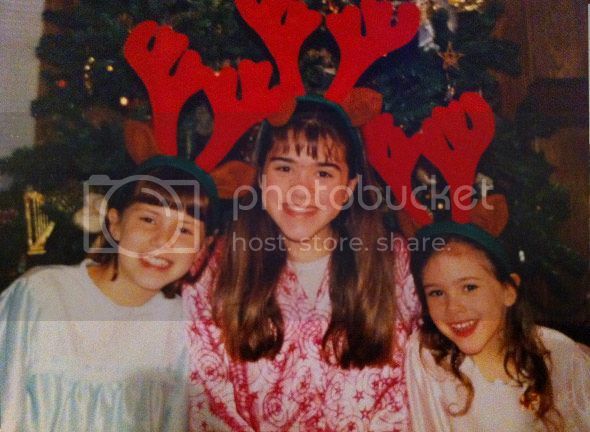 Then I spent $3 on the ribbon at a thrift store, made all the pinecone ornaments, bought the sparkly Owl ornament for a little over $1 at Walmart, and everything else I already had from childhood or from the last couple of years! 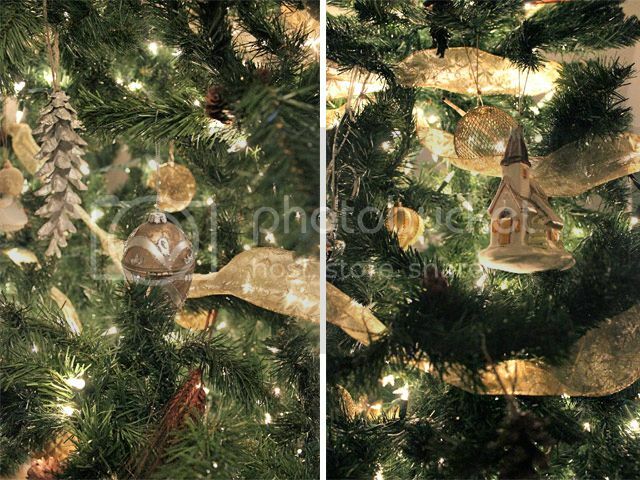 A few detail shots of some favorite special ornaments. 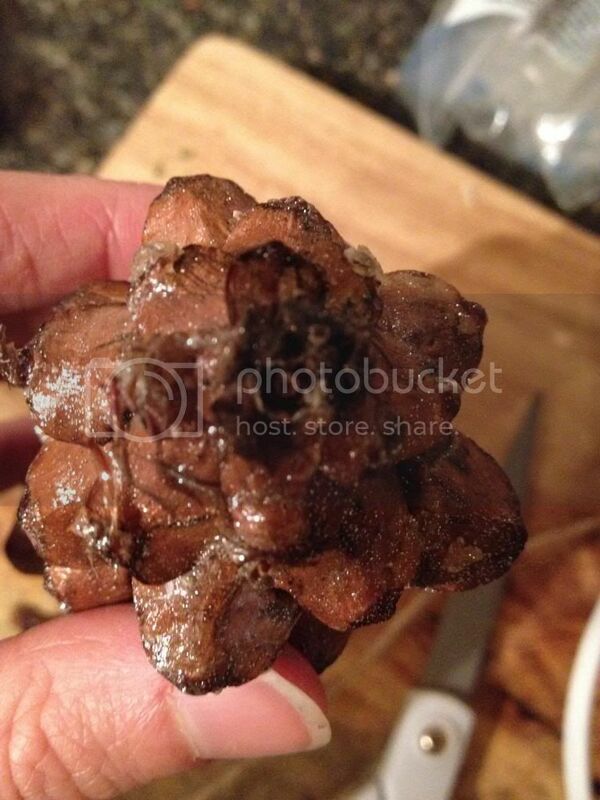 I made the pine cone ornaments. More details soon. 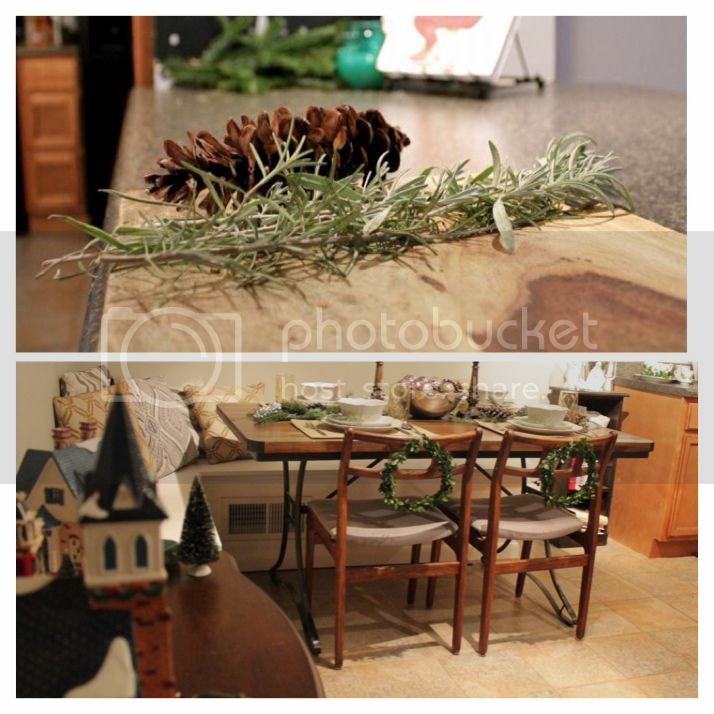 I even stuck some stalks of wheat leftover from my fall decor in the branches for some texture. A few things I learned about decorating a tree: 1. Layering is important. 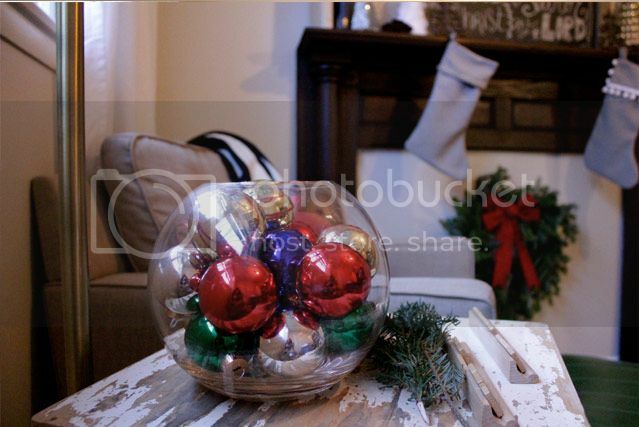 Hanging ornaments at different depths really adds a lot to the...well...depth. 2. Use what you have. 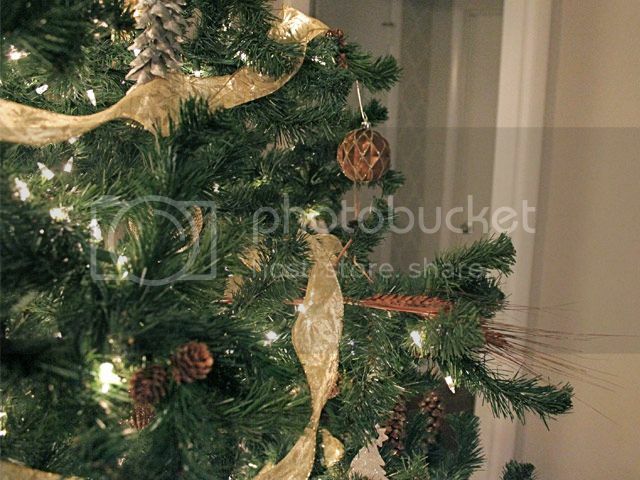 You don't have to stick to traditional ornaments. 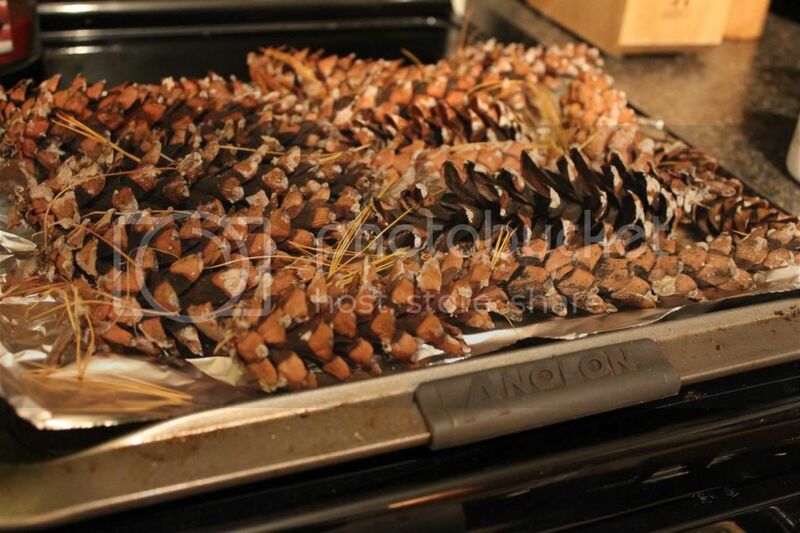 Pine cones found in your yard and random items collected from your home are fair game. 3. Rome wasn't built in a day. 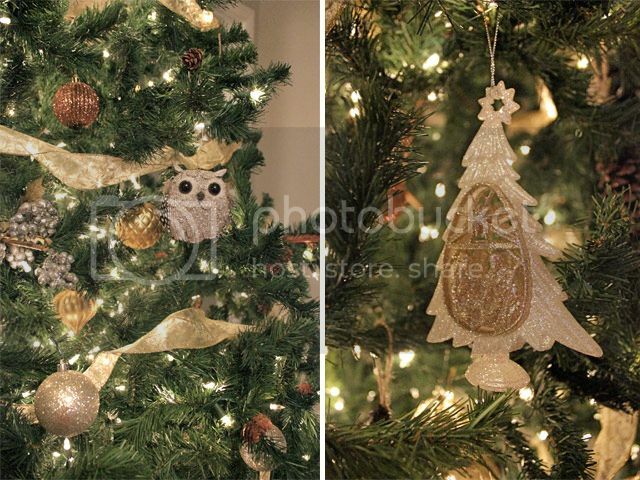 Next year, I would love to have some larger statement ornaments for more variety, and I would love to add something fun like feathers or tinsel. But it's ok to take it one year at a time. P.S. Want to hear a secret? 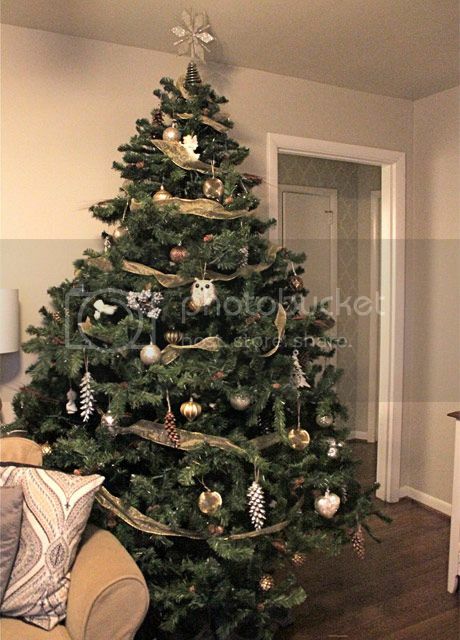 The tree was a wonderful gift, and it was a little too big to fit in our living room, so we folded some of the branches up against the wall to make it a 3/4 semicircle tree. 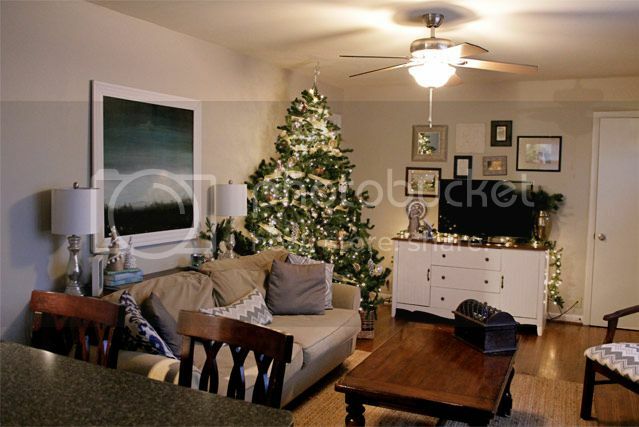 Sometimes you just gotta do what you gotta do :-) Come back Monday for a full Christmas Home Tour! P.P.S. This is my 100th blog post! Thanks for sticking around and paying attention to my little voice on the web. It's been a fun journey so far! 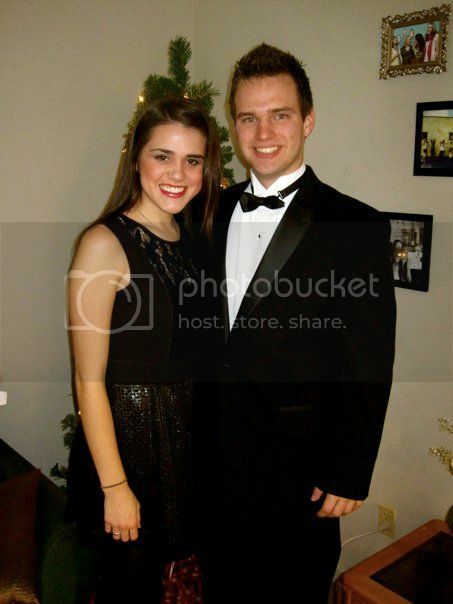 Happy Christmas Season! 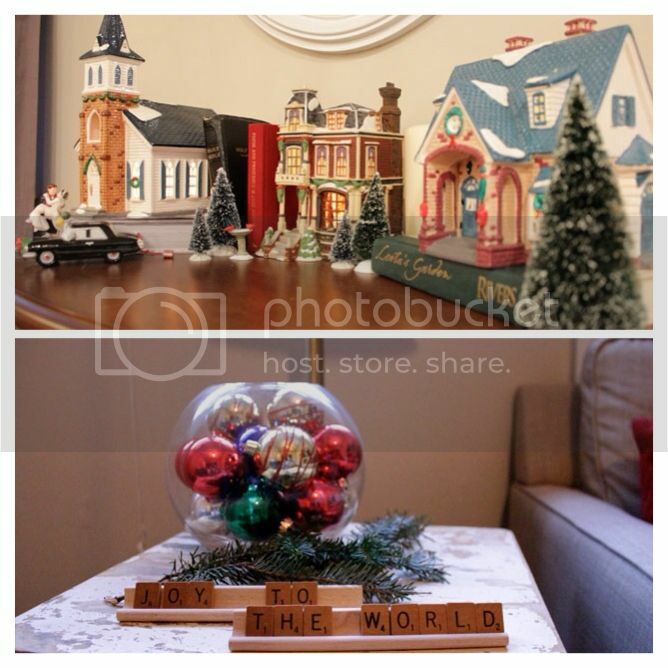 Oh I just can't WAIT to show you all of the Christmas decorations in the works at our house right now. The halls are being decked, and it is so much more magical this year in a home of our very own. I had plans for a different post today because I wanted to wait until you saw the whole house before sharing details on Christmas decor, but I just couldn't hold it in. So I'm starting with one of my favorite Christmas crafts this year, and I will be sharing the whole home holiday tour very soon! One of my favorite Christmas displays in our home is our Christmas tree forest that is now gracing the mantel in the office. 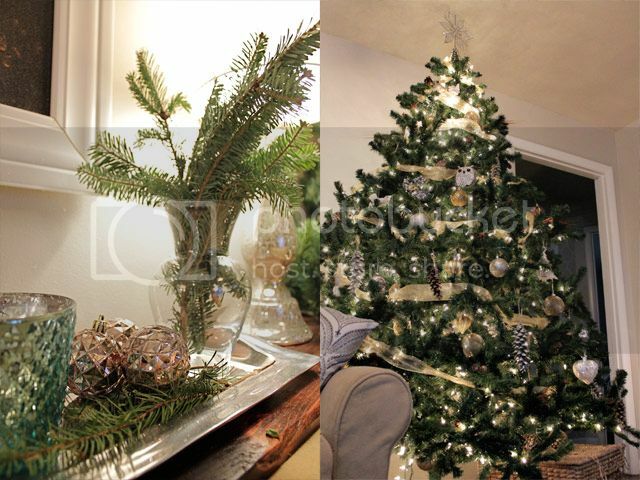 Amidst my silver trees from Home Goods and my green tree candle from a local thrift store stand a few homemade trees. I can't claim any of these ideas as my own. 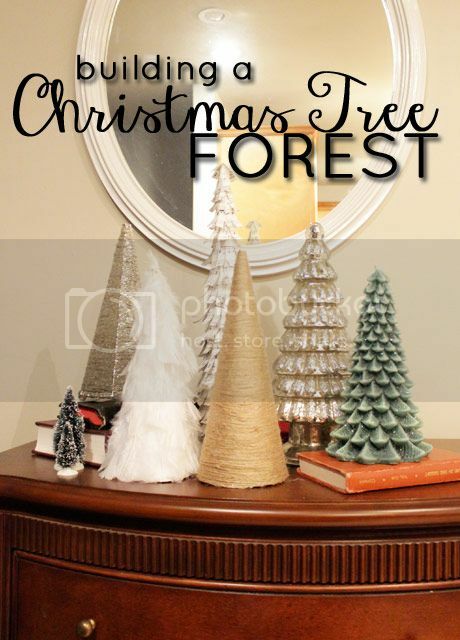 I was originally inspired by Beautiful Matters and her Christmas tree forest, and I put my own spin on a few trees. This was so simple. 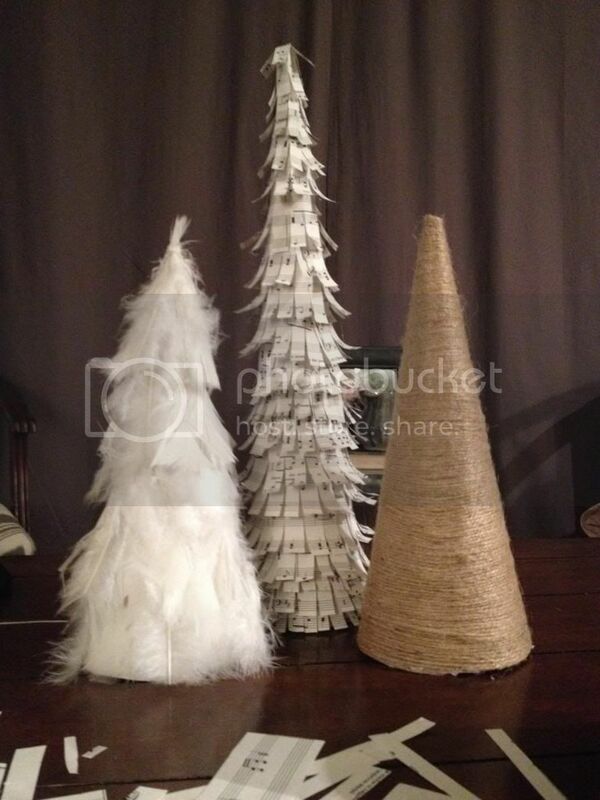 I saw these feather trees at West Elm for over 20 bucks a pop. 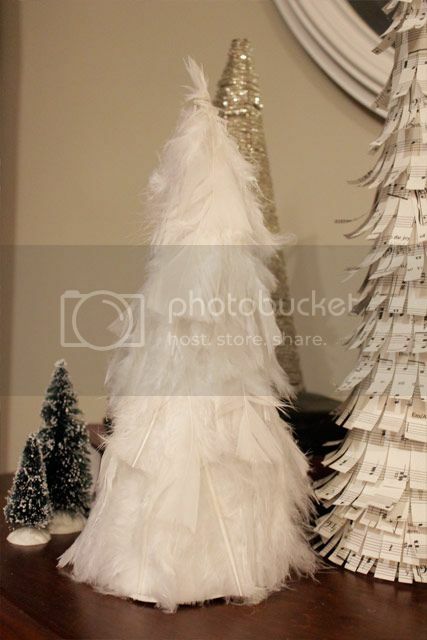 I made this tree for less than $2 using some feathers from Michael's and my handy dandy glue gun. 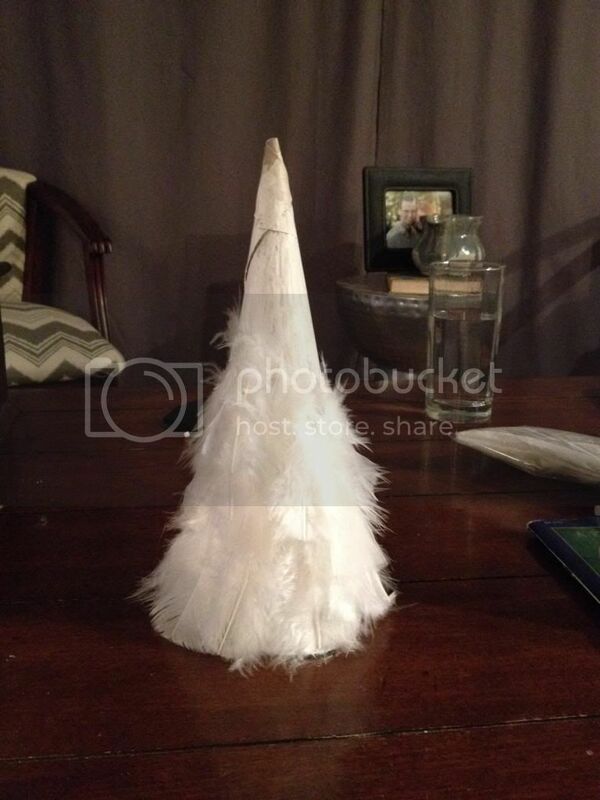 It's important to paint the cardboard white first because the feathers are sheer. 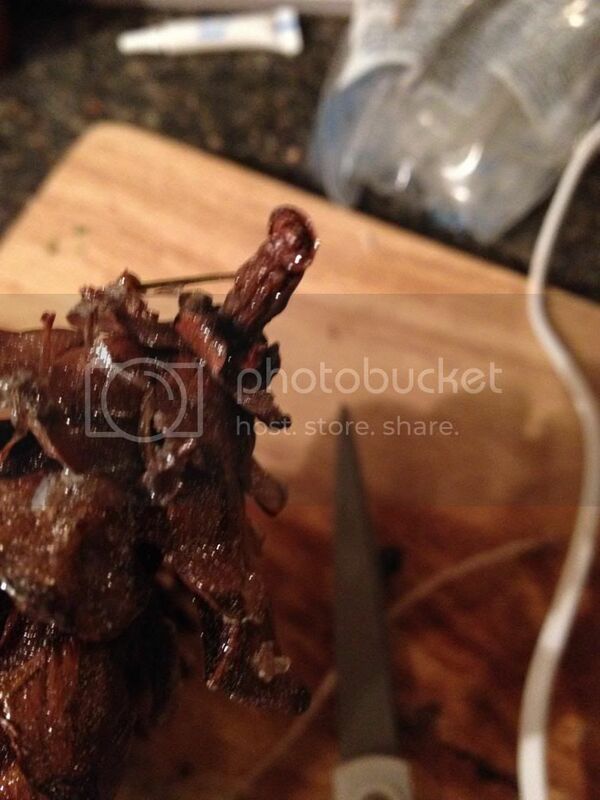 Then I just cut the feathers in half and arranged them at random starting at the bottom. 2. 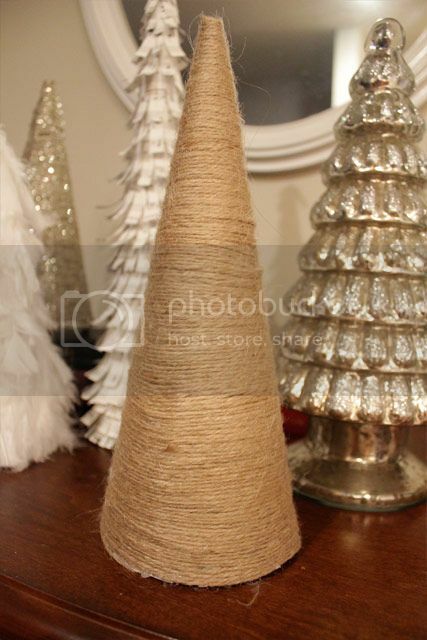 Twine tree All I did for this tree was wrap the twine around the cone and dot hot glue every once in a while as I went. There really isn't anything to it. 3. 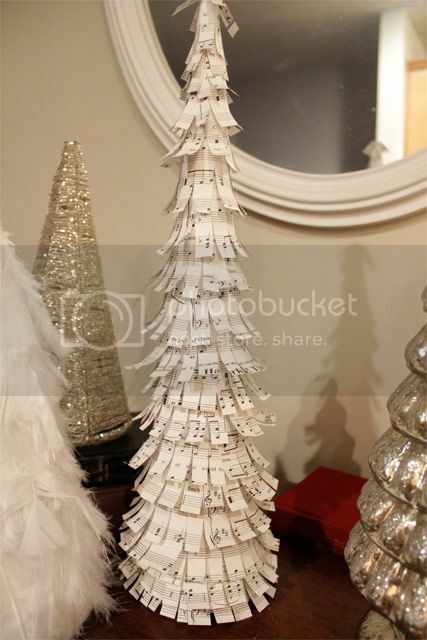 Sheet Music Tree This is by far my favorite, and it by far took the longest. 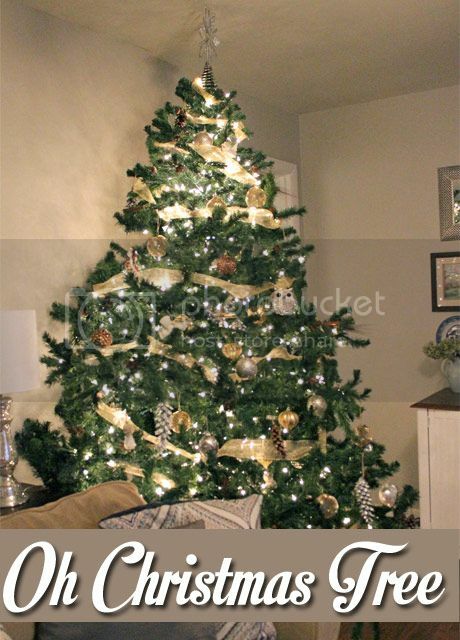 I bought this old Christmas choir musical at a thrift store filled with Christmas sheet music, and then I followed this tutorial to create the tree. 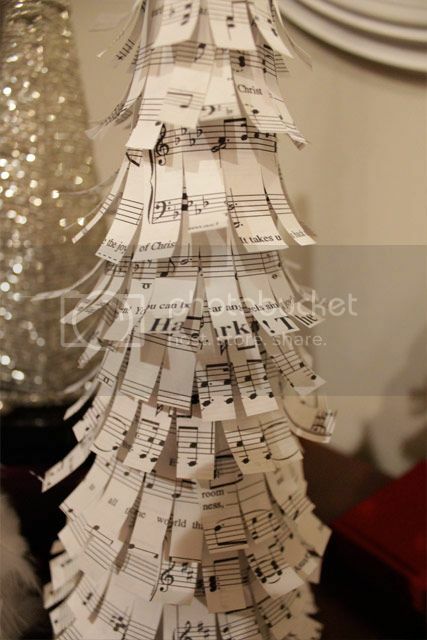 I love the way you can see the lyrics from favorite Christmas hymns on leaves of the tree. So there is your teaser for our Christmas decor! Stay tuned for another "Where To Shop" series tomorrow and more Christmas coming soon! 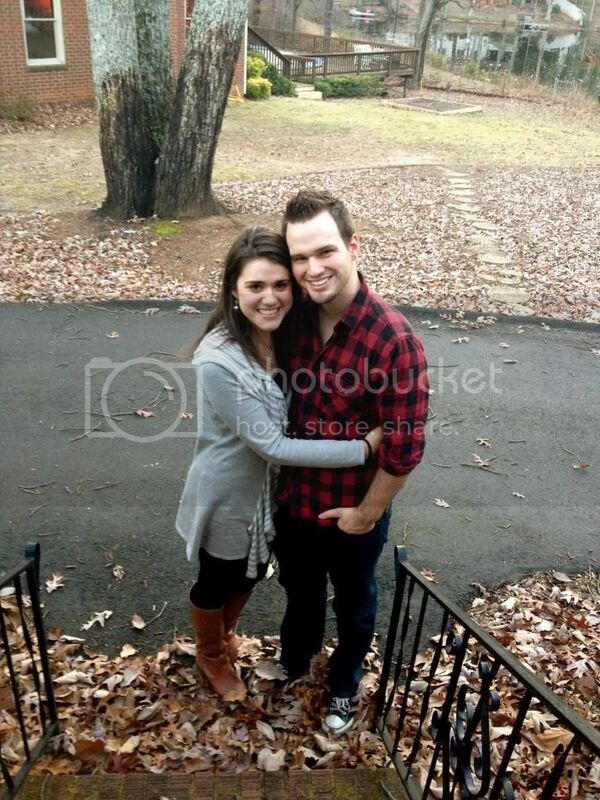 I hope you guys had a fabulous Thanksgiving! We sure did! We are down to the wire with Thanksgiving plans since the big day is tomorrow. 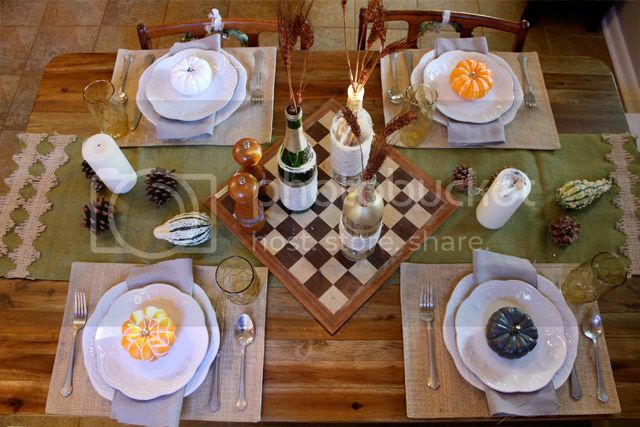 I am not hosting Thanksgiving, but I have still had tablescapes on the brain. 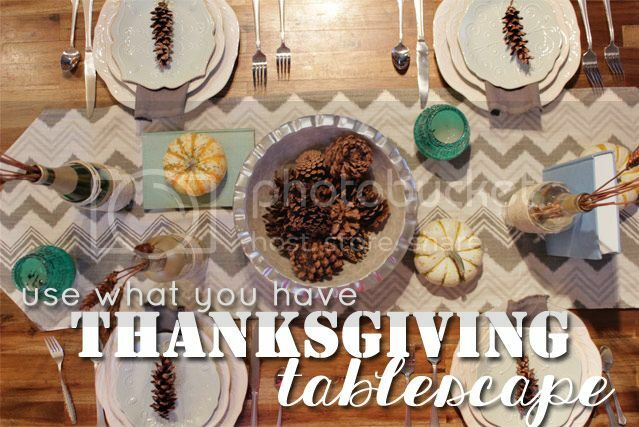 If you have yet to figure out what your table will look like tomorrow, I figured I would go ahead and share my super quick, use what I had Thanksgiving tablescape. I didn't buy a single thing, and it took me about 10 minutes. You still have time! With Christmas decorations making their way up from storage, I put my fall decor to use one last time. 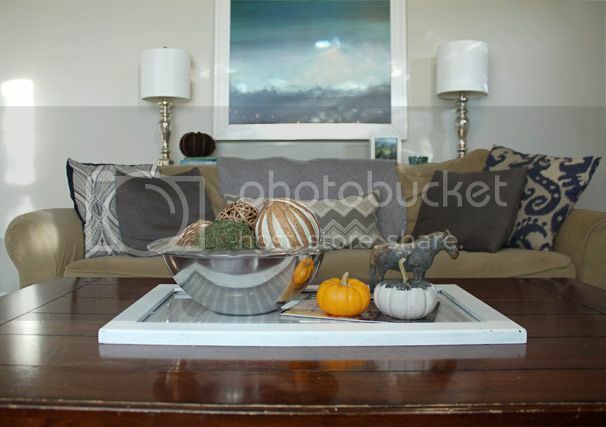 Our house doesn't have hardly any traditional fall colors in my everyday decorations. 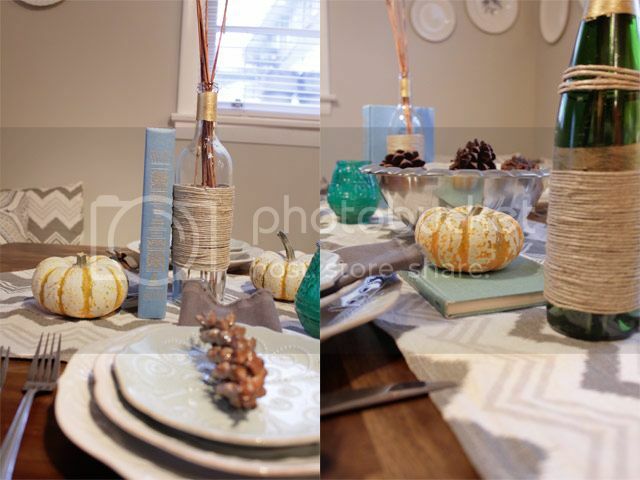 Most things are grays and blues and greens, so I decided to keep that theme throughout the table decor while adding hints of whimsical Fall themed elements for a Thanksgiving feel. 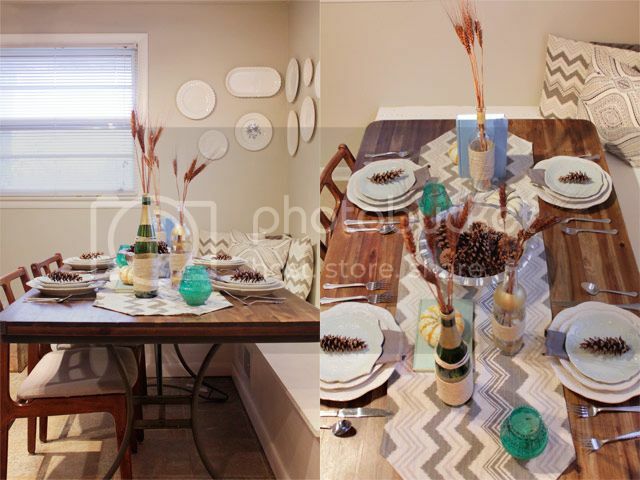 The table runner was made from the same fabric as my chevron chairs and accent pillows. I still have loads of that fabric leftover, and my mom made this runner for me before I had a sewing machine of my own. 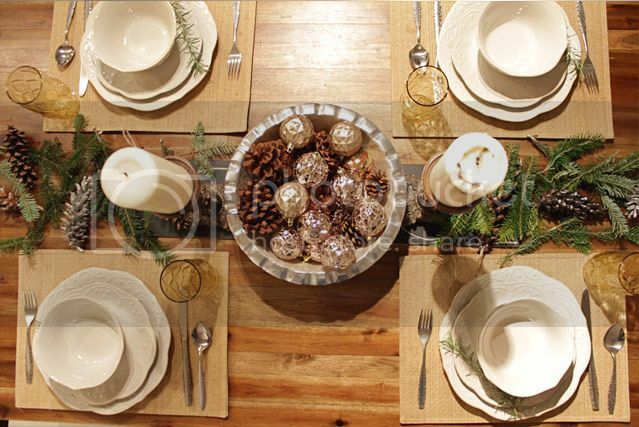 In the center of the table, fall bottle vases, mini tiger pumpkins, and candles are offset around a gorgeous silver bowl with iridescent pearl interior filled with scented pinecones. 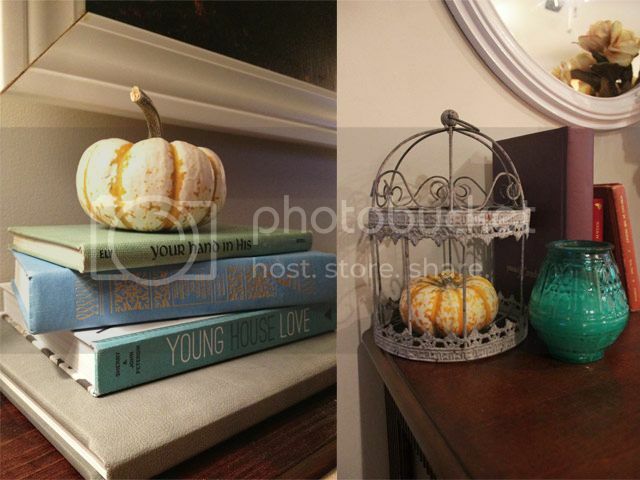 One of my favorite things to do is add vintage books to a vignette. 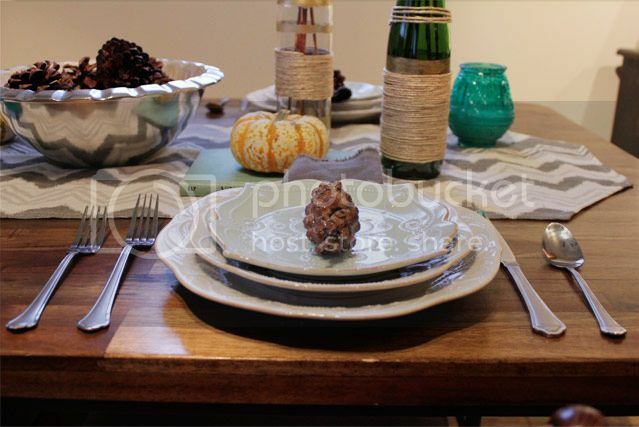 For the place settings, I layered our Lenox French Perle dishes from dinner plate, appetizer plate, and finally my set of blue dessert dishes. No two are alike. 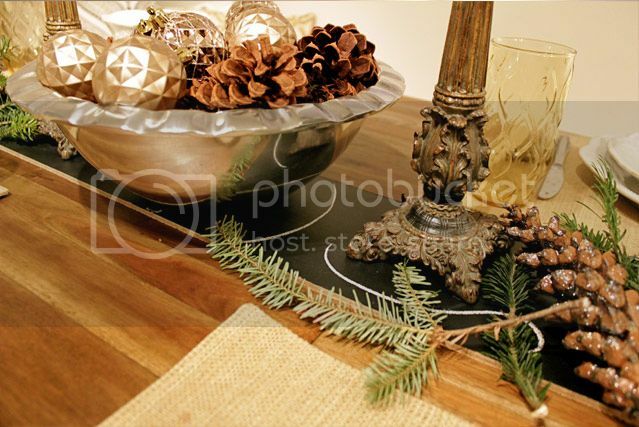 I added in a dark gray napkin underneath the dessert plate, and on top a glittery pinecone. 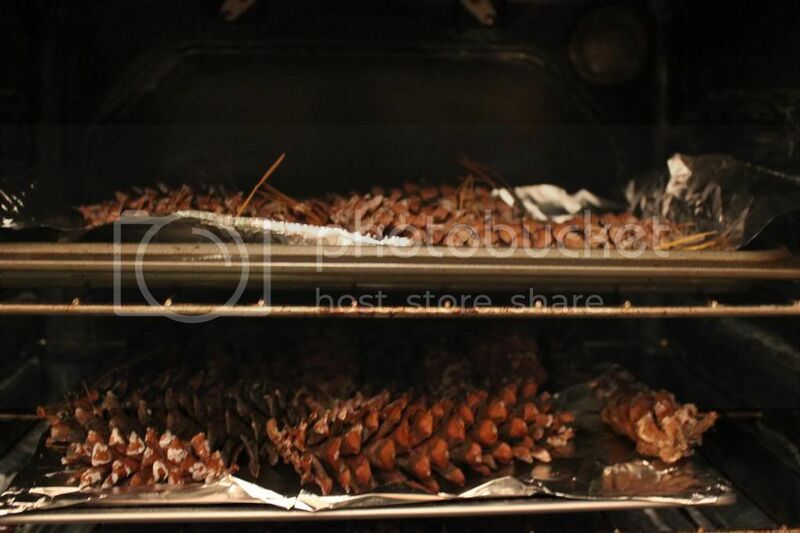 I collected these pinecones at the park near my office, baked them, and sprayed them with silver glitter. Keep an eye out for them to make a second appearance in the form of Christmas ornaments. 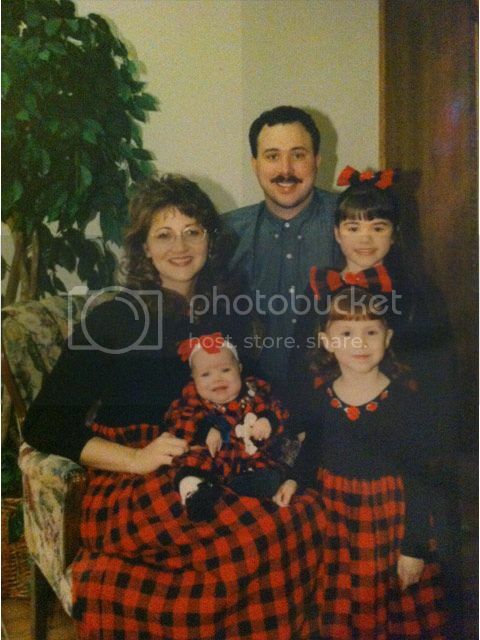 Now I wish we actually were having Thanksgiving at our house. 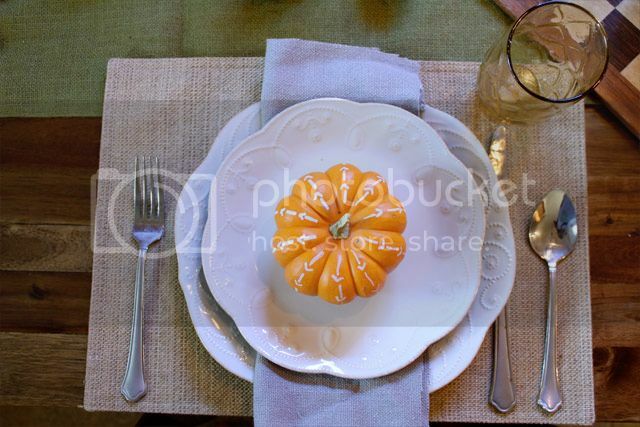 It was so much fun setting the table; imagine the fun if I added a Turkey to the mix! P.S. Thanks for sticking with me in my quiet November blogging month. We have been so busy and out of town every day I wasn't working, so the blog has suffered. But life is more important anyway! 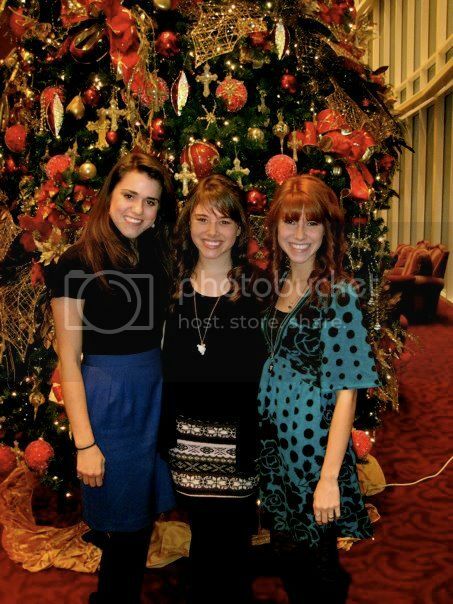 Stay tuned for lots of Christmas posts to come. 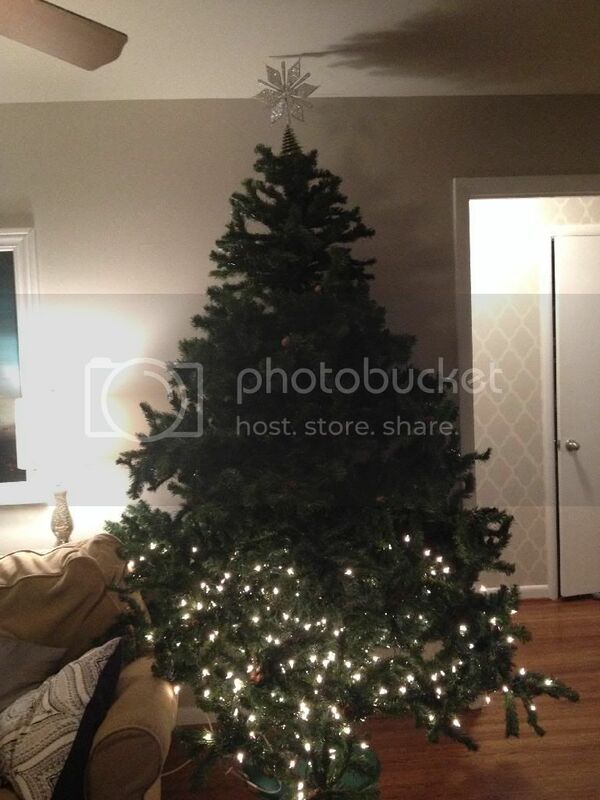 Last night we put up the tree. We only got this far. Oh well. To be continued.